This post is sponsored by My Wonderful Walls. All opinions are entirely my own. Recently, Ash and I have been getting a toddler room ready for our sweet little son, which means new furniture, new color schemes, and of course, new wall decorations. His nursery decorations were random things that I put together before he was born. So it was time to decorate with something he really enjoys. With all of the adorable (and expensive!) artwork out there for kids’ rooms, I decided to venture out and make my own. My goal was to create something special to hang on his walls that he would treasure – and that I wouldn’t grow tired of later. 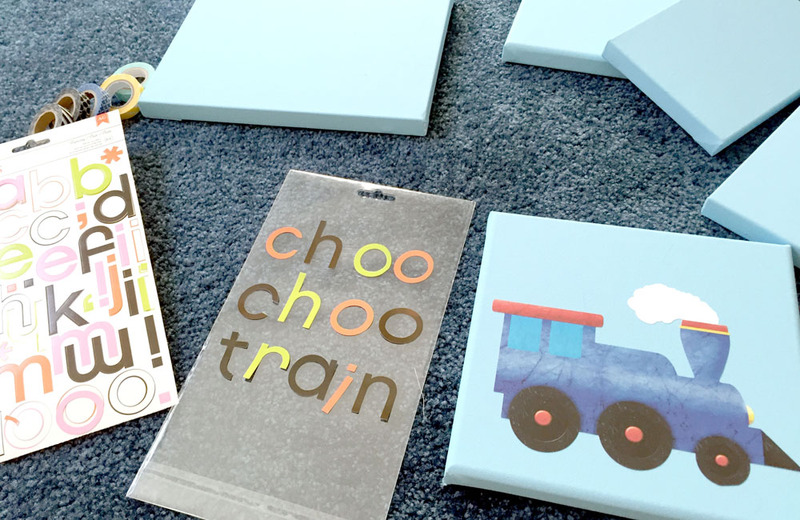 So, with just a few key materials, I was able to create these adorable DIY canvas wraps. They are so simple to make! . 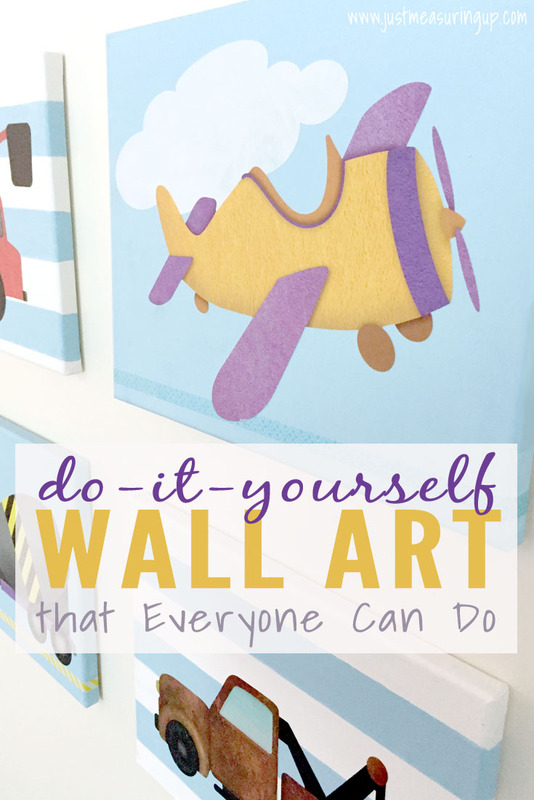 We are giving away a $50 gift card to My Wonderful Walls to one of our readers. The prize was provided by My Wonderful Walls. Eligibility: Open to legal residents of USA who are 18 or older. Void where prohibited or restricted by law. We love My Wonderful Walls products so much that we also have a 15% off coupon code for everyone. Just visit My Wonderful Walls and use JUNE15 at checkout (expiration June 30, 2017). I had this vision to create something with little effort that would also save others time and money on room decorations. This vision included using gallery wraps or wrapped canvases. I wanted to avoid the hassle of frames – it’s a lot of work to pick out frames, mats, and work out sizing. As an added bonus, wrapped canvases are super easy to find at craft stores, usually are on sale, and definitely save money- as frames and mats are much more expensive. Plus, I was happy to avoid having a bunch of glass frames hanging in my son’s room. Next, I searched high and low looking for wall stickers or wall decals that I liked. Yet, rather than stick these directly to the walls to create a mural-like piece, my thinking was that I could easily stick these wall decals to the canvases. It would certainly make for a really simple but elegant project. The problem? A lot of wall decals for kids look really cartoony. I wanted to find something that looked more authentic and artistic. Then, I stumbled across My Wonderful Walls and LOVED the vehicle stickers they had. Their vehicle stickers have so many colors and details – they look almost textured. I fell in love with this rusty truck (pictured below). Isn’t it adorable?! Also, their wall stickers were a really nice size and would definitely fill 9×12 and 8×10 canvases. Budget-Friendly Tip – When buying the canvases, paint, and other materials from the craft stores, check for sales and coupons before going. A lot of times the craft stores run 40%-60% off canvases. You could also use a coupon and buy a pack in bulk. Some craft stores even have surveys you can fill out that gives you a discount off of your next purchase. In order to get the sizes right on the canvases, I waited to purchase the canvases until I received the stickers. Then, I took the vehicle decals to the craft store with me, so that I would get the canvas sizes right. The wall decals came in one long roll, so it was easy to bring to the store with me. 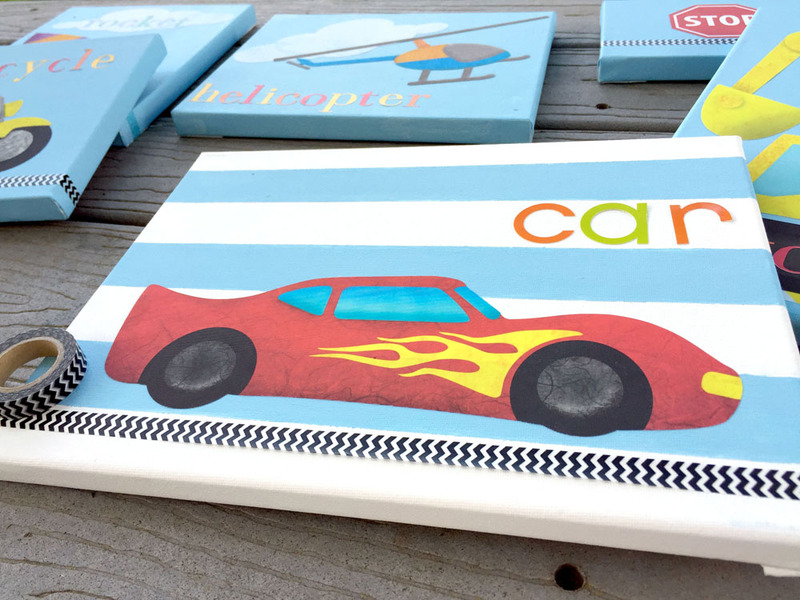 Because the vehicle stickers from My Wonderful Walls were a really nice size (and this was their mini kit), most of the canvases I bought were 9×12, 8×10, and a few 8x8s. 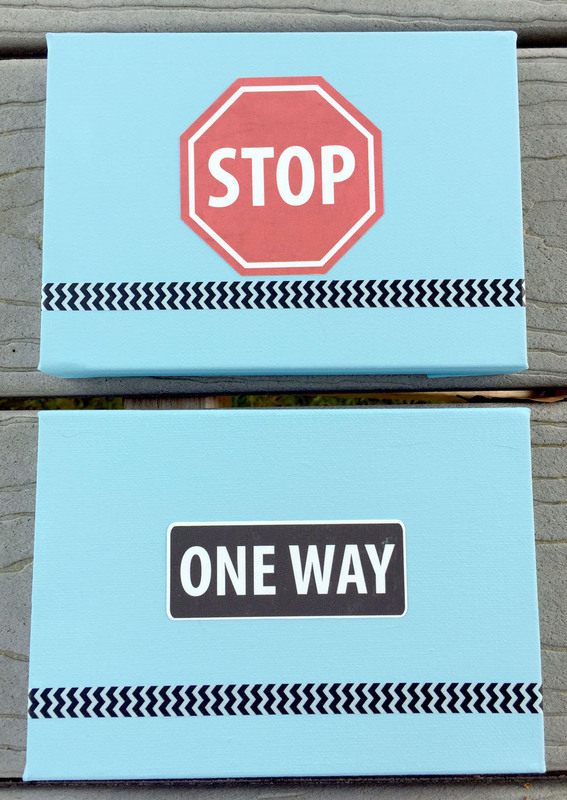 I also picked up a few little 4×6 canvases for the road signs. With all of the stickers and canvases, I definitely had enough to decorate a large room. After I had my materials together, I first cut out each wall sticker and placed it on the canvas that it would go on. I also arranged groups of canvases together to visualize how they would look on the wall. Time to paint! You could do this in a few different ways – you could just paint a solid background or you could create a design with painters tape – like stripes or chevron. You could even do polka dots, if you have adhesive circles! It’s up to you how creative you’d like to be. I decided to opt for mostly solid backgrounds with a few striped canvases too. The solid background was easy to do. It took me two coats of acrylic paint. Be sure to paint the sides too – to give it the gallery wrap look. Painting the stripes was a little more difficult, but I eventually got a perfect technique down. I would highly recommend using painter’s tape and nothing else, as you will get the strongest stick. 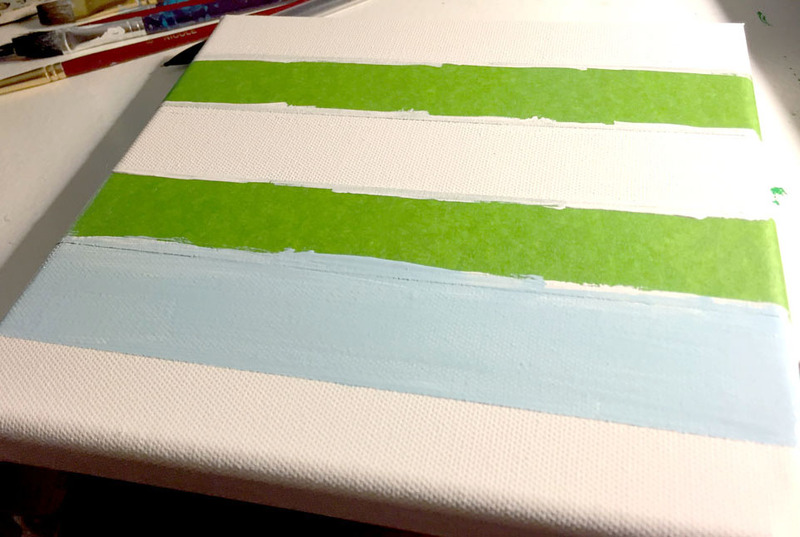 On my first attempt, I used painter’s tape and then painted the blue stripes – and I got a very imperfect line. After a bunch of experimenting (even tried gesso – which made no impact), this is how I got perfect stripes. Place your painter’s tape on the canvas. Next, use white acyrlic paint to seal the edges of the painters tape to the canvas. You are essentially creating a seal, so the intended color (blue in my case) doesn’t leak under the tape. Wait a minute or two – but don’t let the white dry completely, and paint the stripe your intended color. Do a even stroke, going only one direction, so that your intended color doesn’t get underneath the tape. Peel the tape off right away (after you are done with the top and bottom line). Once acrylic paint dries, it’s very plastery, so you want to remove the tape before the paint dries. In the below picture, you can see the first stripe painted, with a perfectly straight line. Above that, you can see the white sealed edges along the green painter’s tape. Now, some of my blue stripes were streaked with white from the seal I painted, but I much preferred going over the stripe again rather than having a jagged edge. I also recommend having a practice canvas and painting short stripes, before attempting a good canvas. Once I had the routine down, each of my canvases came out perfect. Now for the fun part! 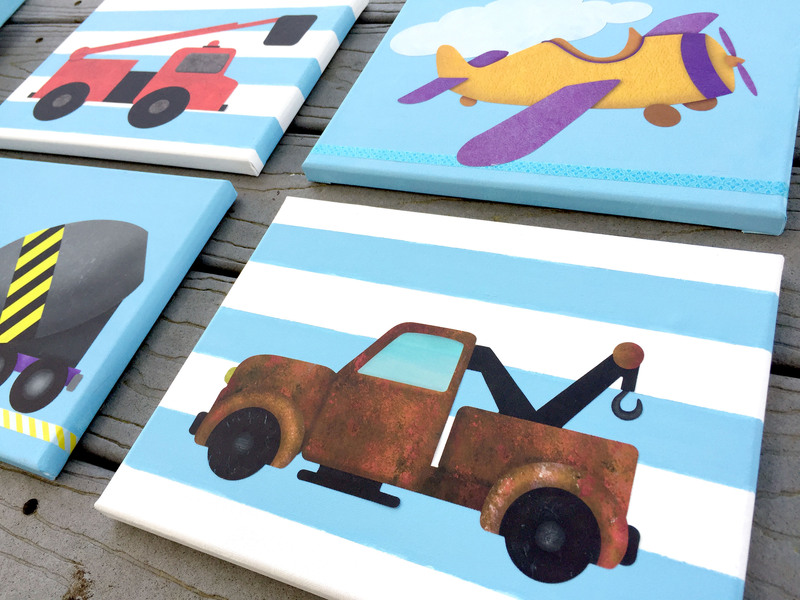 It was time to stick the vehicle wall decals to the canvases. The wall stickers were such great quality and so easy to work with. The stick was perfect – and they were easy to move when I changed my mind on placement. One of the things I definitely wanted on the canvases was the name of the vehicle. 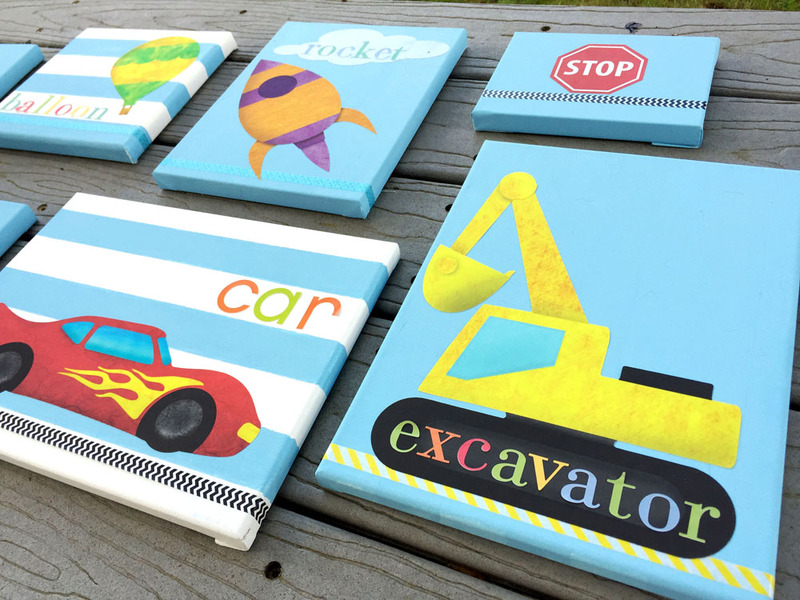 My son is very visual and has taught himself lower case letters just from observation, so I figured if I passively have the names of the vehicles on the canvases, he will learn to spell. So, I labeled as many vehicles as I could with the alphabet stickers I had. (This involved getting a little creative and “making” some letters). Last, I felt that some of the canvases needed a little extra touch. I saw some cool washi tape at the craft store and added it to the canvases. 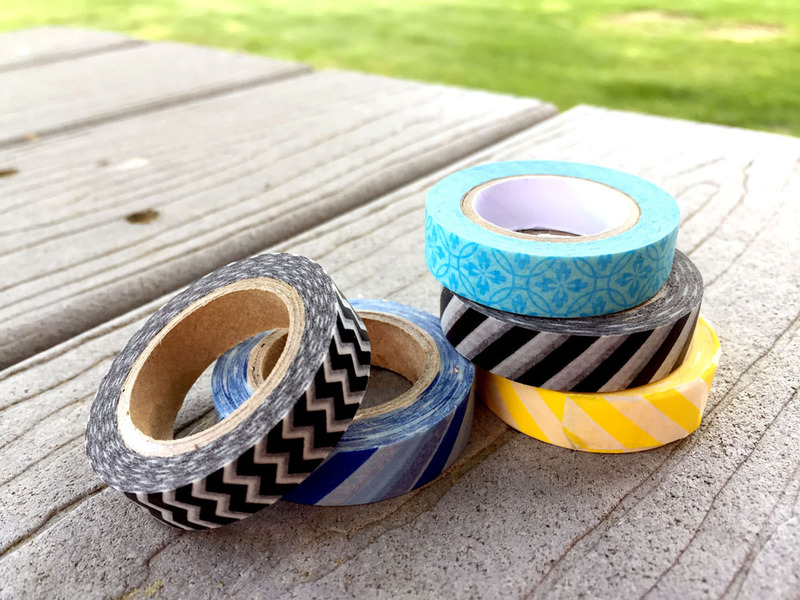 I’ve never used washi tape before, but I’ve seen so many cute creations with it that I thought I could use the washi tape to give the look of roads, construction signs, and railroads. It was the perfect touch! After collecting the materials, the DIY wall canvases took about one to two days to make, including dry time for the coats of paint. It was a super quick project. The cost really depends on how many of the materials you need to purchase. 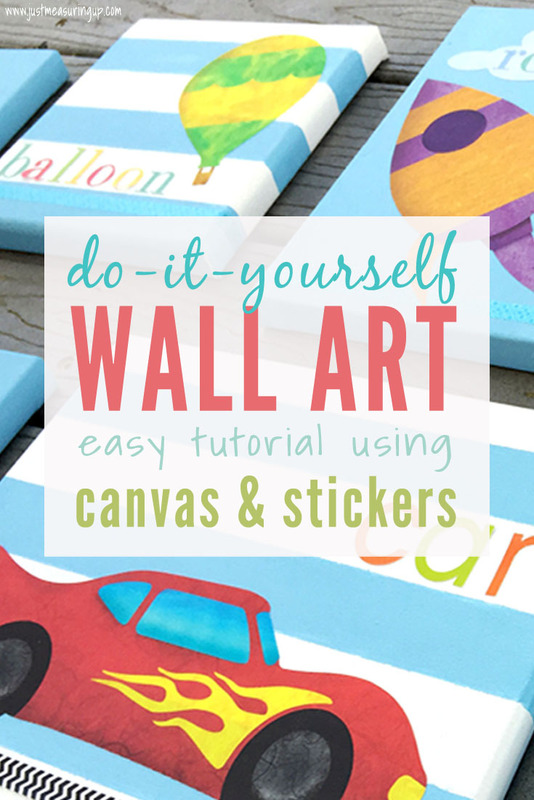 If you have paint and alphabet stickers, then you’ll just need the canvases and stickers. 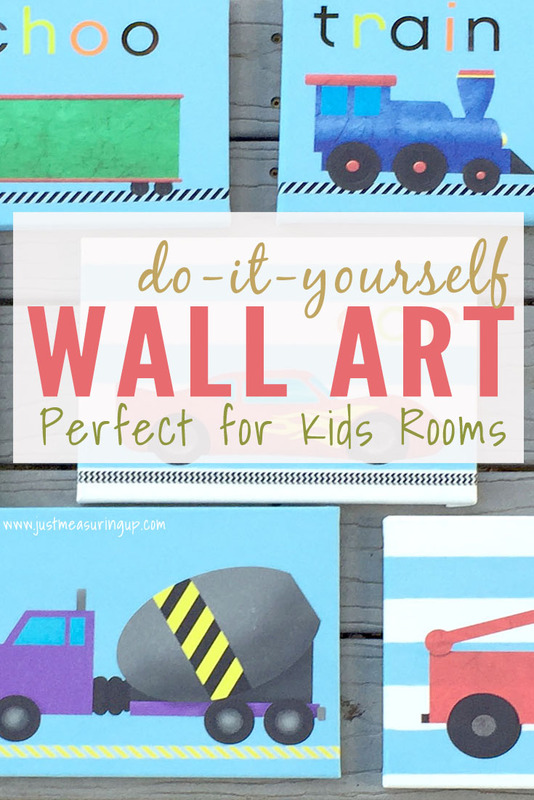 If you are looking for a simple tutorial to make DIY wall art for kids rooms, definitely consider this one. 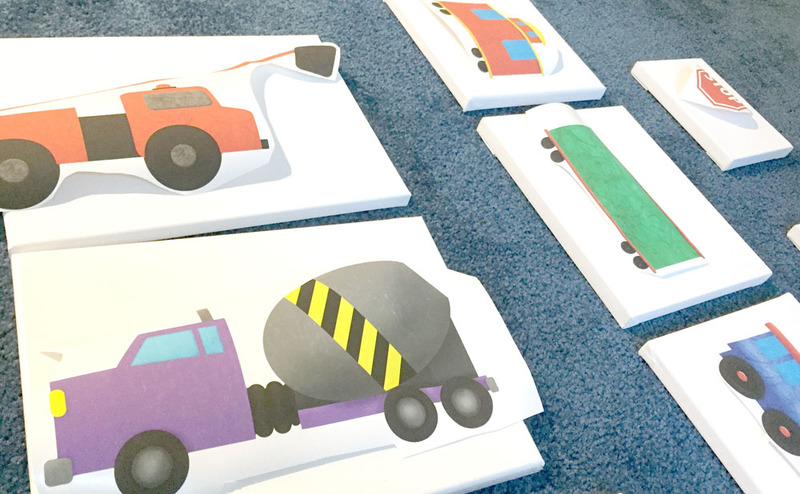 The materials were easy, the canvases were simple to put together, and they turned out great. You’ll definitely save money while creating something your children will adore. I absolutely adore photographs. My walls are covered with galleries of pictures – whether they date back to when my parents and grandparents were young or when my siblings and I were growing up. Not to mention, Ash’s childhood pictures which are just amazing. And, I simply adore looking back at pictures of our sweet son. It’s funny how quickly kids change. Whether it’s a look back on one’s life in pictures or a little memory book of a fun day trip, DIY photo books are simply the sweetest gifts. They spread love and laughter, bringing back all those happy memories that are forgotten in the day-to-day. My sisters share my love for photos, and we love making picture albums with all kinds of DIY photo book ideas. We love to choose some kind of theme with funny, silly, or relevant sayings that accompany the pictures. These photobooks are so unique and such a hit, as they turn out amazing! Keep reading for all of our DIY photo book ideas! Check out our four favorites – a photobook of commonly-used sayings, quotations from various countries of travel, a Seinfeld-themed book, and special occasion photobooks. Then, see how you can easily make a DIY photo book for the ones you love. So, my sisters and I brainstormed all of the the phrases we could (this involved a few phone calls and visits to mom to jog our memories) and picked our favorite 60 phrases. Then, we went through all of the photos – past and present – and matched the phrases with relevant pictures. This was especially entertaining. 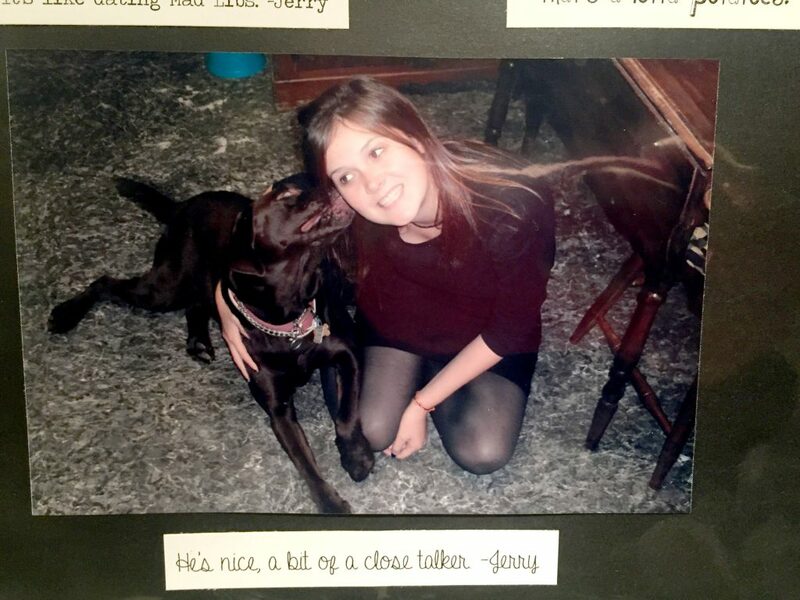 Looking through piles and albums of old photos was a blast – and we were cracking up matching photos with mom’s sayings. 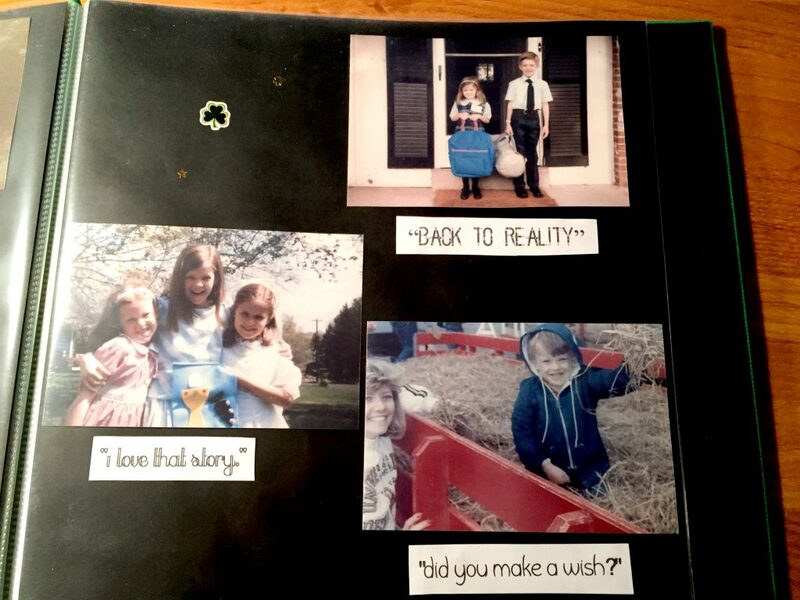 We found one of mom cleaning the dishes for “The kitchen is closed,” a picture with all of us standing with our coats on for “I’ll let you get going,” an old first day of school picture for “Back to reality,” a picture of us playing in the hay for “Did you make a wish,” and many more. Then, we put the pictures in chronological order, so it was like a real photo album, telling the story of the past 60 years in the DIY photo book. As far as the design for the DIY photo book, we made this book like a scrapbook, printing the pictures and gluing them down. We even printed each saying in a unique font. For example, the school pictures had a font made of pencils and the “Ok ty <3” text message was written in a typewritten font. I love how much character that fonts add, so this definitely made for a nice touch. The DIY photo book turned out amazing. Not only does my mom treasure it, but the photo book always gives us a good laugh too. It’s such a fun way to put together a collection of photos from the past. 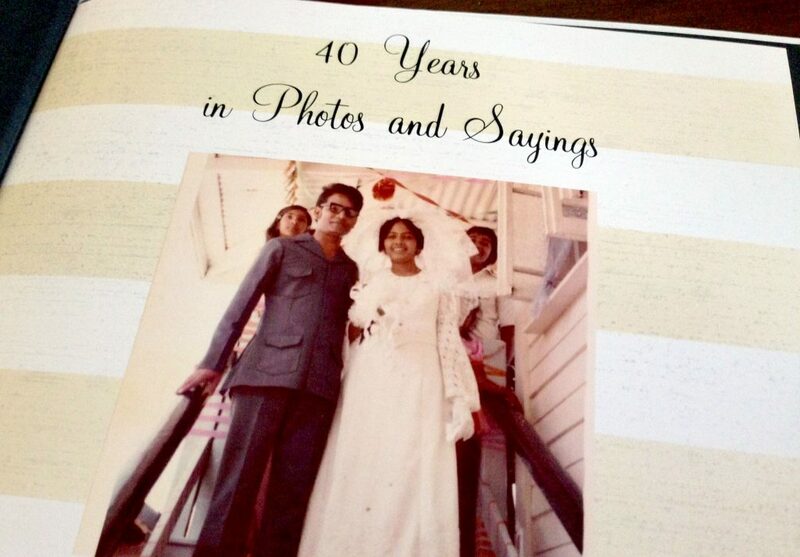 With my in-law’s 40th anniversary coming up, my sister-in-law and I decided to make mom and dad a photo book too. Ash and his family have had the unique experience of living in four countries. Each of these places had their own sayings, dialects, and cliches. Ash, my sister-in-law, and I picked out sayings that were common to those countries. Then, we paired them with pictures of his family at that time. I absolutely love the way this DIY photo book turned out! The sayings were so funny to hear. I mean Ash talking in a Jamaican accent alone was cracking me up. 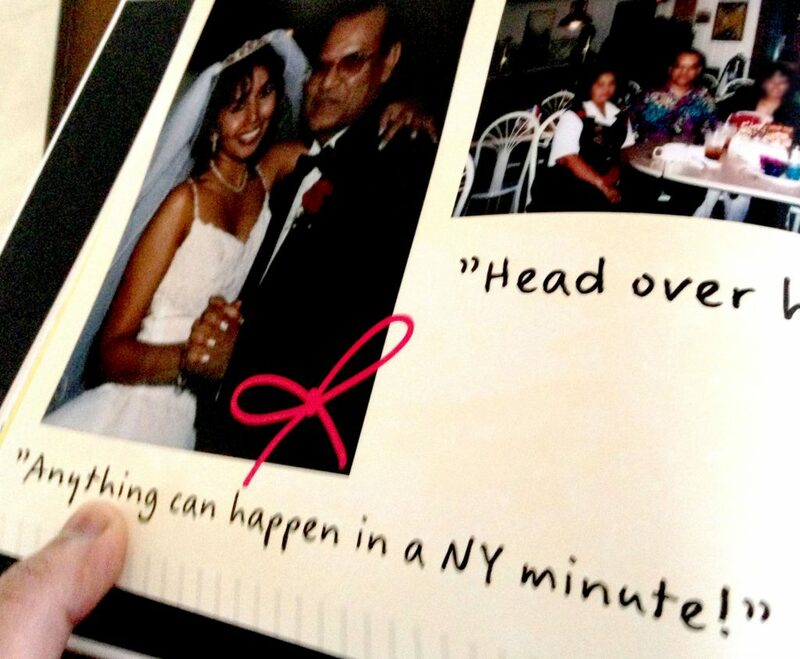 The DIY photo book started in Guyana, referring to spicy curry and roti. 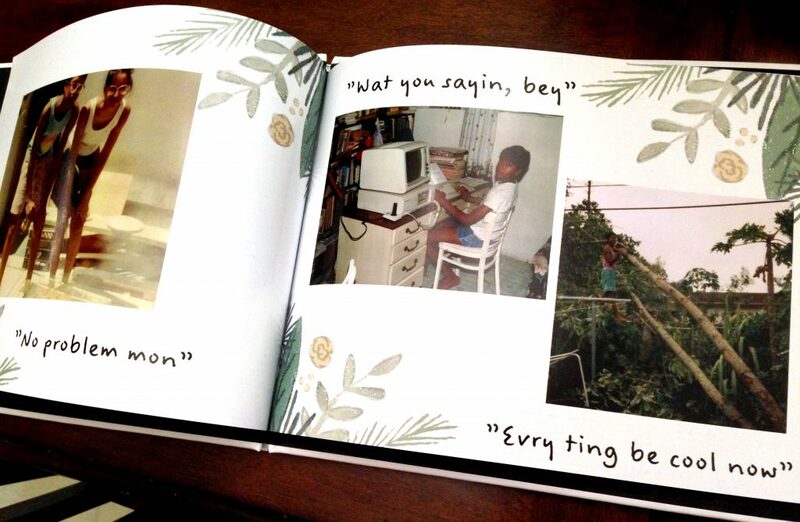 Here are a few from Jamaica – Ash loves the picture on the right of the photo book. He’s climbing a fallen tree after a huge hurricane hit. 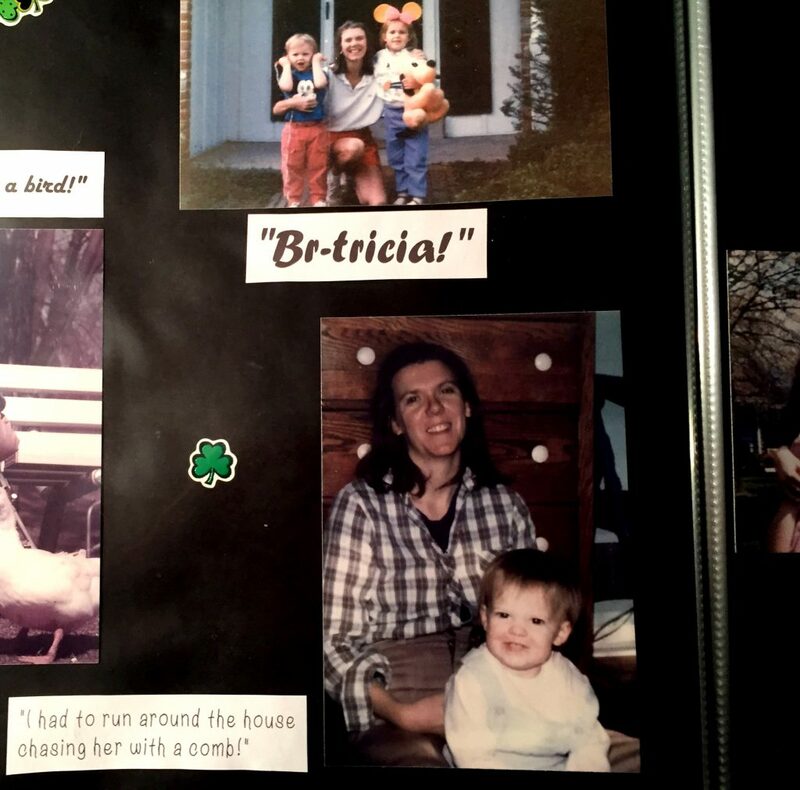 We included photos with all the grandchildren and phrases like “hold your horses” and “pretty darn quick” that are unique to the United States. The DIY photo book turned out so cute – and was such a beautiful montage of all the experiences and memories of the past 40 years in four countries. So, we did exactly that. We ran with the Seinfeld theme, using dozens of hilarious quotes from the television show and pairing them with pictures of Bridget over the years. The DIY picture book turned out awesome. 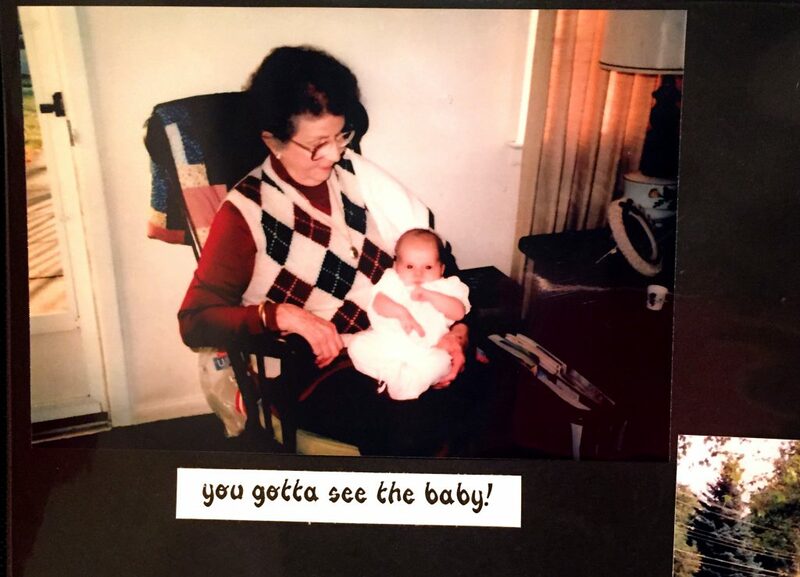 We started the photos chronologically, beginning with a baby picture of her and our Nanny, quoting the Seinfeld episode from The Hamptons. The photo below is one of my favorites. We were at a family get together and someone took this candid shot of us. I mean, look at each of those faces! After all these years, we finally found the perfect Seinfeld quote to go with it. 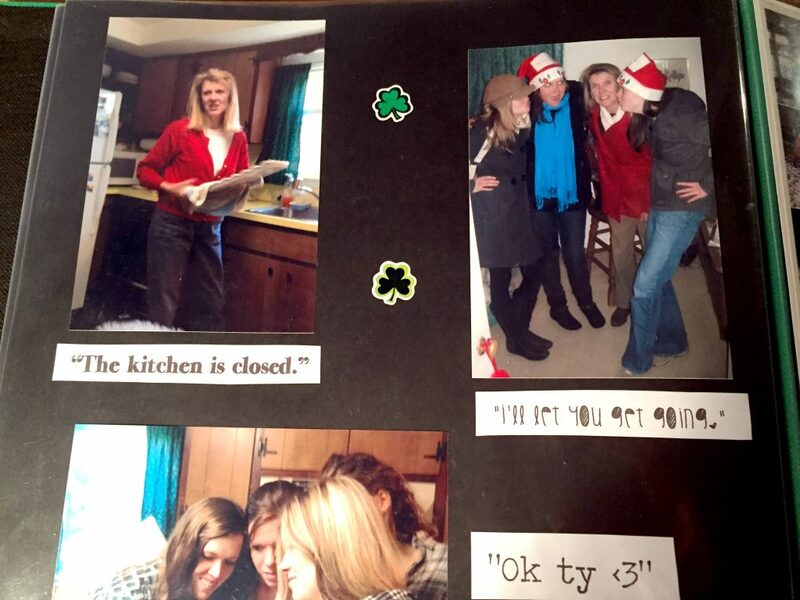 And, of course, we had to include “close-talker” in the DIY photo book. 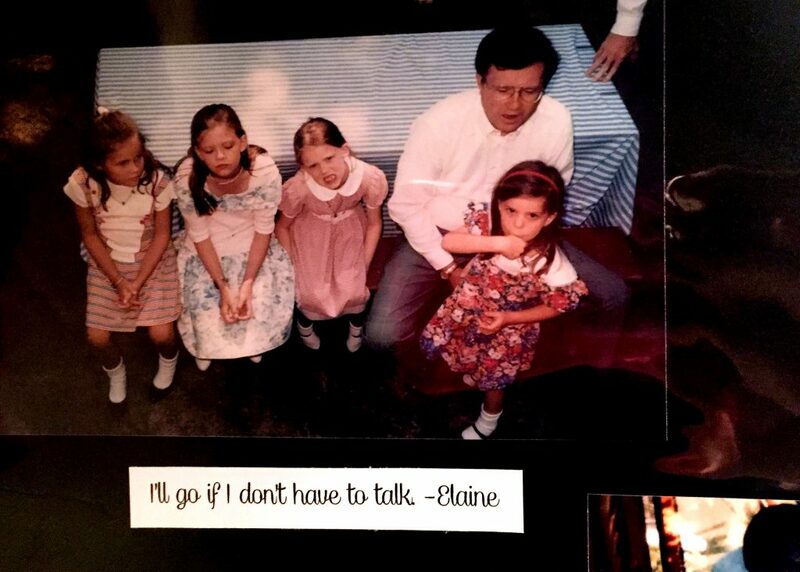 We tried to limit the quotes and photos in the picture book to 30 in honor of 30 years. Yet, with all of the funny Seinfeld quotes and pictures we had collected, 30 was a drop in the bucket. The Seinfeld DIY photo book ended up being much longer (and hilarious). As a thank you to grandparents or friends going on a day trip or vacation, I love making a cute book of the pictures we took. We recently went on a trip to a train museum and petting zoo, and it was a really perfect day. To thank my parents, we made them a little memory photobook with our favorite pictures from the day. They LOVED it. There weren’t any fancy quotes in this one – just some cute designs and fun pictures. You have so many options when creating your DIY photo books. We have made so many of these, so we have plenty of tips to share! You can make your DIY books either digitally or scrap book style. I like using Walgreens for photobooks. You can use same-day pickup on some items (check which items for your local store before starting your book). The hardcover photobooks tend to be better quality when you have them sent to your home instead of same-day. Yet, if you are running short on time, same-day pick up is a great option for your DIY photobooks. If you are working on the project with someone else, like a sister or friend who doesn’t live close, you can both log in to work on the photo book before printing. Also, definitely search google for a Walgreen’s coupon code. They always run deals, so you will do well with the price of photo books. You can also make the book scrapbook style. Albums can be ordered on Amazon or picked up at a craft store with a coupon. 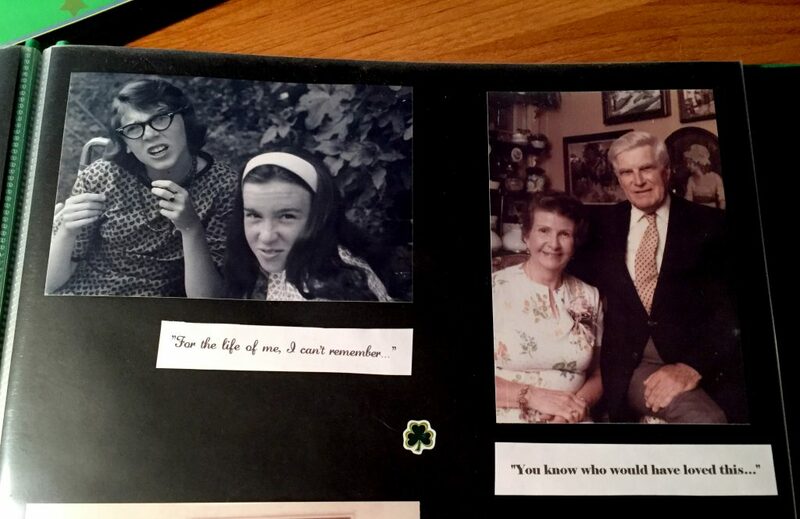 We made my mom’s DIY photo book this way, and it was nice because each of my three sisters and me had a role. One of my sisters printed the photos with her 4×6 photo printers. (It’s awesome!! We always have her printing pictures for us 🙂 One of us bought the stickers, album, and embellishments, one of us printed all the quotes in cool fonts, and another sister put everything together. 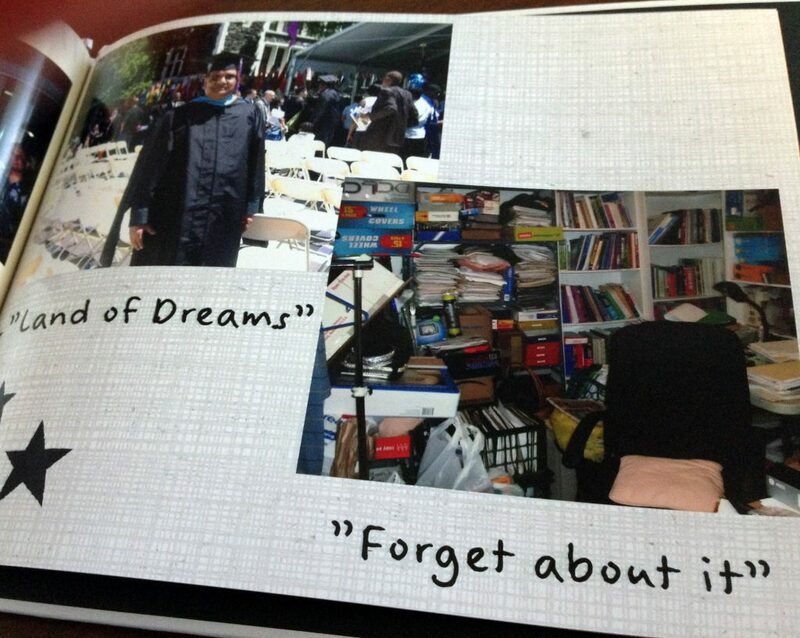 To keep everything organized in the DIY photo books, as far as quotes and pictures, we used Google docs. You can easily share this with others. So, we made a simple spreadsheet of quotes and then wrote a description of picture we planned to use. This kept everything organized and sequenced properly. As far as themes for the sayings or quotations for your photobooks, you can be as creative as you want. Think about your recipient’s life and interests, and I’m sure something great will come to mind. 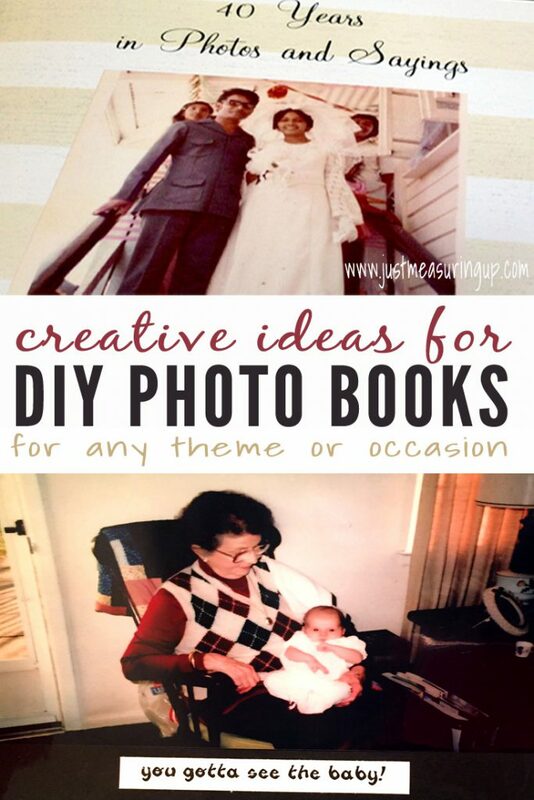 DIY photo books also make a great gift for father’s day and mother’s day. You could pair photos of your kids with funny things they say (I should make this for Ash!). It doesn’t have to be a grandiose book – a collection of 10-20 photographs in the picture album will turn out wonderfully. With today’s technology and everything being digital, it’s hard to find time to organize and print photo albums. Dropboxes and clouds (wherever they are) are filled with hundreds of pictures that aren’t looked at often. This is exactly why I love making photo albums for others as gifts. And, exactly why these picture gifts are adored so much. DIY photo book gifts are simply awesome presents to give. Not only will your recipients love the collection of pictures, but they’ll just adore the cute or funny sayings you included too. My mom, sister, and in-laws absolutely LOVED the photo books. I can’t tell you how many laughs the Seinfeld book got – or how much my mom chuckles looking back at her photos and her sayings. And who couldn’t use more laughter and love in their life? 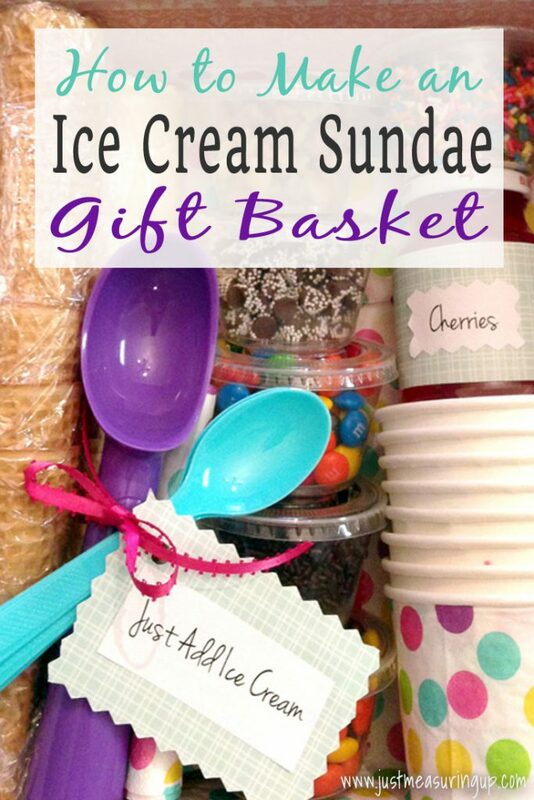 For other gift ideas, check out our ice cream sundae gift basket and our Valentine’s Day Scavenger Hunt. Every holiday has become alarmingly food-centric. Quite frankly, it stresses me out. ​Bags filled with candy for Halloween, baskets and plastic eggs brimming with junk for Easter, stockings filled with sugar for Christmas. Even Irish potatoes have taken over Saint Patrick’s Day. I’m talking the sugary cream cheese kind, not the ones the Irish actually eat. 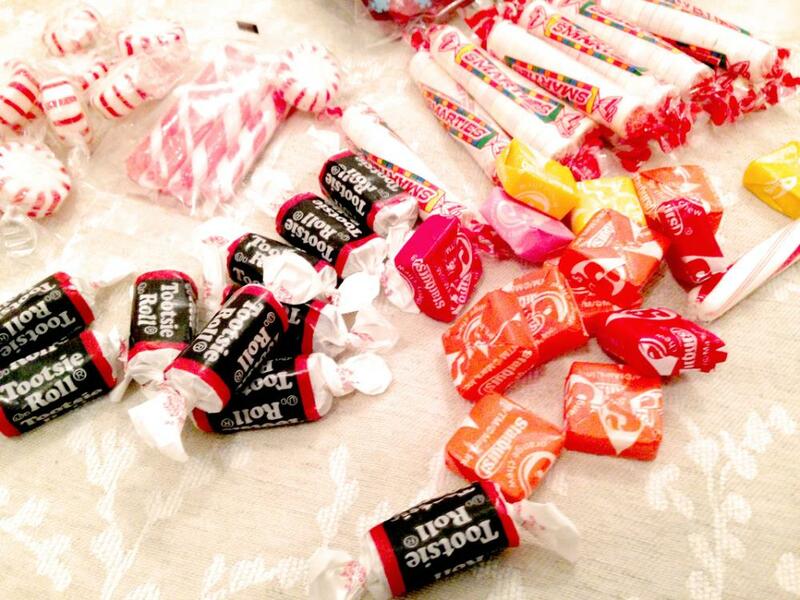 My family and I have opted out of this candy culture for wholesome, healing foods. In doing so, we have overcome a myriad of health problems – but I’ll save that for another post. 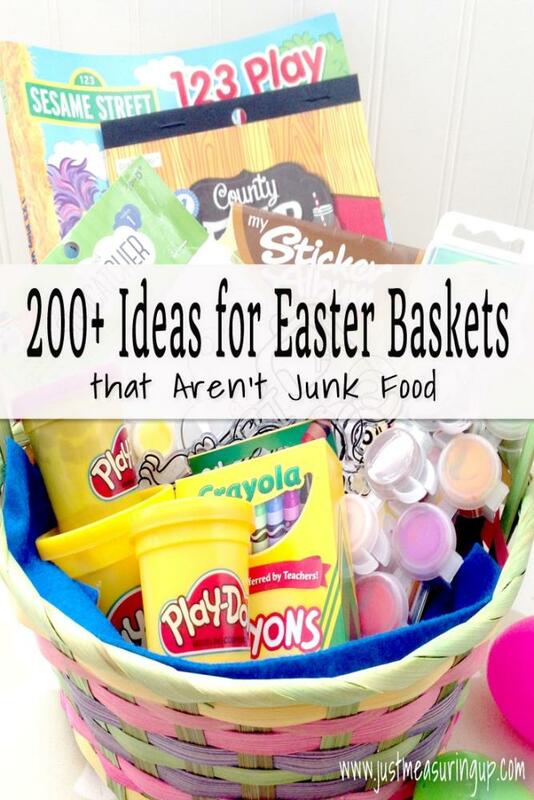 I came up with 200+ awesome ideas for Easter basket ideas that are not only candy-free but also free of sugar and junk. 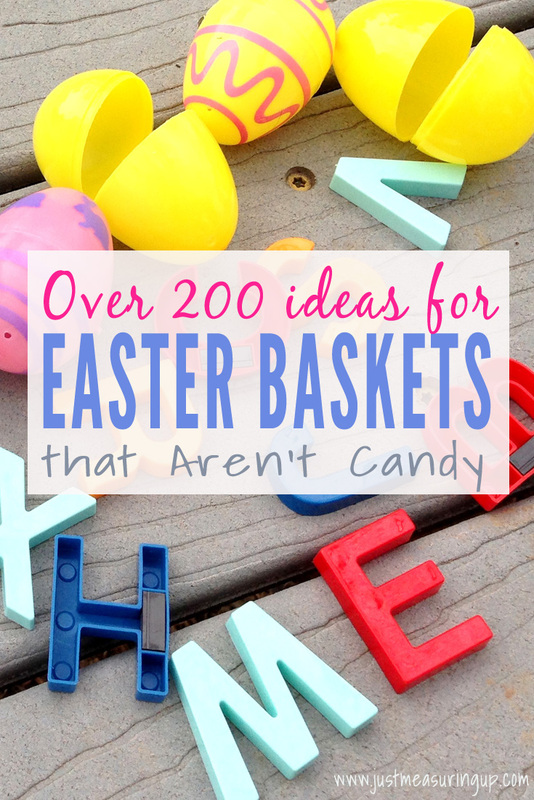 Also, the Easter basket ideas are organized by theme – because who doesn’t love a candy-free themed basket?! In this candy-free Easter basket, you can include all the things one would need for a summery beach trip. Then, line this summery basket with a beach towel, or instead of an Easter basket, use a beach pail. Crafty is the theme of this candy-free Easter basket. There are so many craft ideas out there that you can be as creative as you want. As a nice addition, line this crafty candy-free Easter basket with a plastic tablecloth, for easy cleanup after art activities, and an alternative to Easter basket grass. Outdoor activities, games, and accessories make for a great candy-free Easter basket. Use a blanket, for picnics or relaxing outside, to line this Easter basket idea. 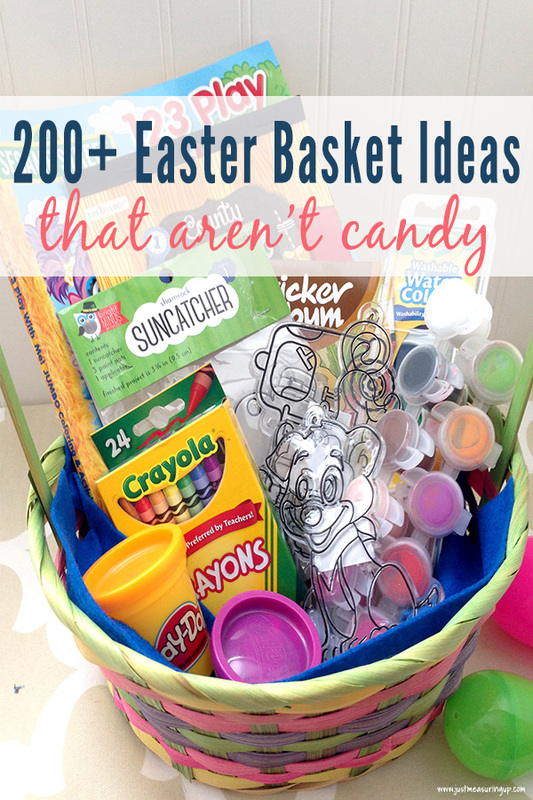 With kids accumulating so many toys these days, why not make a rainy day basket as a candy-free Easter idea? Kids could pick a few toys to play with and the rest get saved for a rainy afternoon. Line these Easter baskets with a picnic blanket or cuddly reading rug. These candy-free Easter baskets is one that’s always loved and appreciated. Who doesn’t love a basket filled with these to decompress with – like cozy slippers, a favorite bath soap, and a good book? 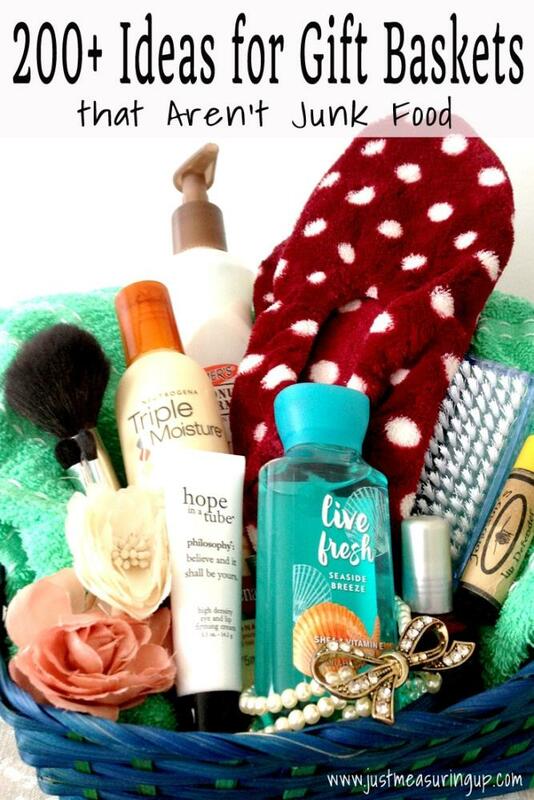 This basket is also great for teenagers. As an Easter basket grass alternative, use a cozy blanket or bathrobe to line this basket. Whether you are trying to save money or your crafty side is running strong, make an entire Easter basket filled with homemade items. There are so many cool things you can make that guarantee hours of fun. Line these homemade Easter baskets with your knitting, hopscotch mat, or t-shirts, as a fun basket liner. For a candy-free Easter basket for college kids, the possibilities are endless. 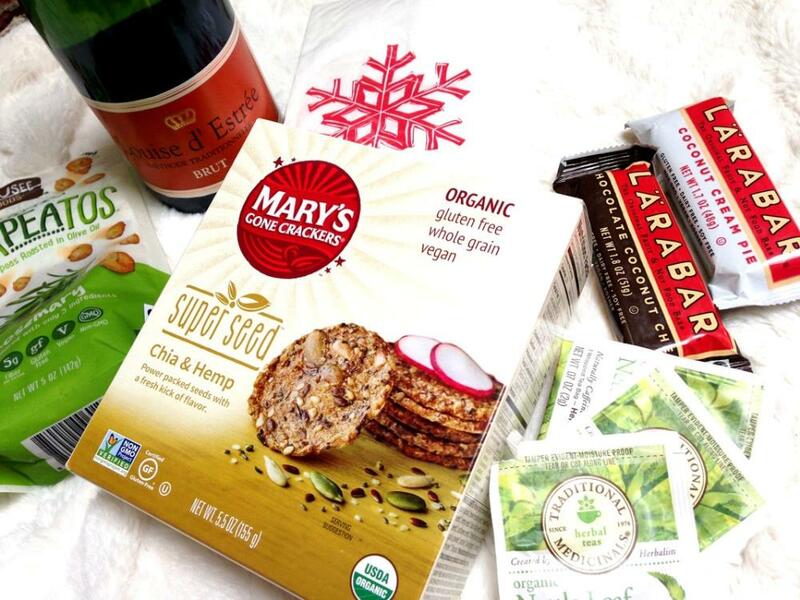 You can put together office supplies, tech items, healthy snacks, or favorite things from home. A cute spring scarf or a college t-shirt would make a great basket liner, rather than using Easter basket grass. For those that have an organic lifestyle or love healthy, healing foods, this Easter idea is perfect! 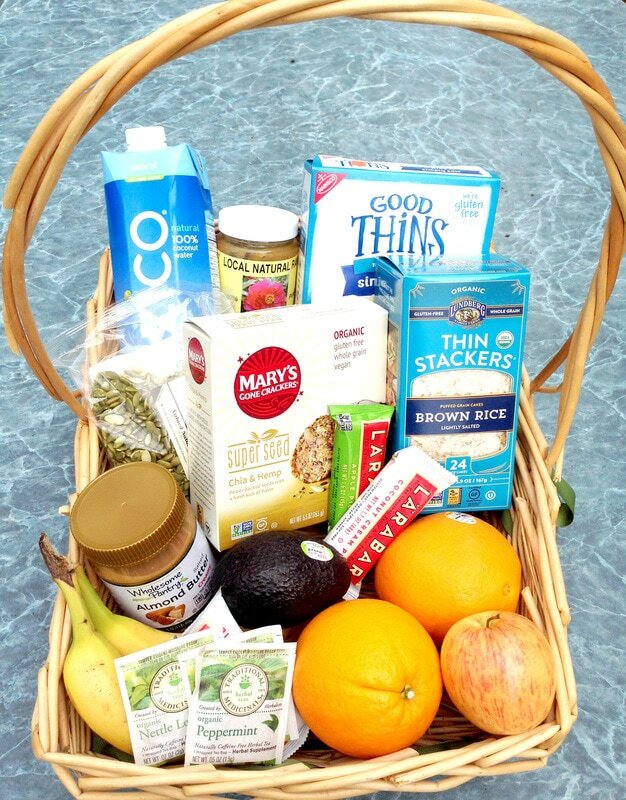 It’s a healthy living basket that is filled with healthy foods – like fruit, nuts, and rice snacks, you could fill it with natural bath and body products, or a mix of the two. A reusable bag would make a great liner for your green friend or family member. ​I would love to get one of these Easter baskets – it would save me a trip to the grocery store 🙂 It’s amazing to know that in the candy-loving, sugar-centric world we live in that you can fill a huge basket with all healthy foods! This is another Easter basket I would love to receive (…hint hint Ash). 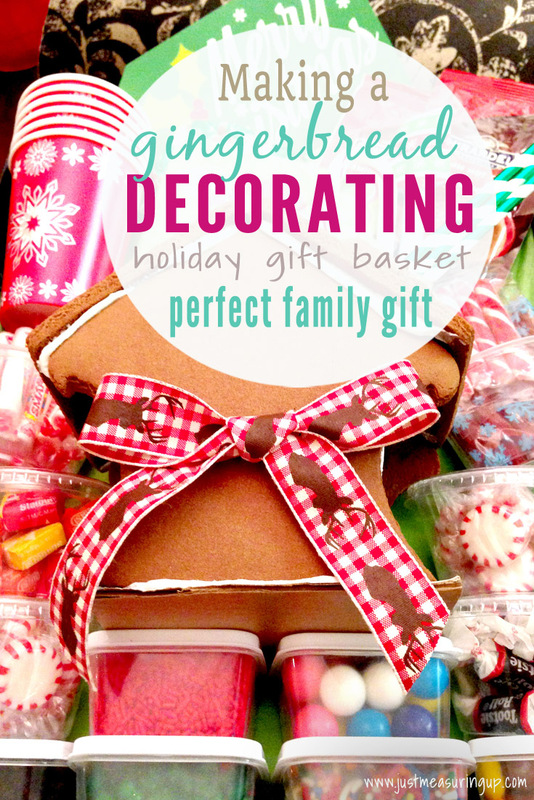 It’s filled with so many fun crafty things – you can be as creative as you would like, and your craft-loving family member or friend will not even miss the candy. Instead of using Easter grass, use felt for a creative liner. Before we had kids, Ash used to make me an Easter basket every year. It was such a sweet thing to do, especially because Easter baskets are usually geared toward children. Whether you have five kids or none, I’m sure your significant other would love a thoughtful basket filled with creative, candy-free items. Use a spring scarf or cozy blanket to line this basket. Having your kids make a basket for their father – or you making an Easter basket for your father is such a thoughtful gesture. You can fill these candy-free Easter baskets with all kinds of dad things – like socks and batteries – and I’m sure they would mind a few fun things too like an iTunes gift card. Use a dad t-shirt to line the basket, as a green alternative to Easter grass. T-shirts – homemade are great! When putting together Easter baskets, don’t forget about your mom. There are lots of fun things you can fill the candy-free basket with that she will love. I’m sure she’ll love that you thought of her. A cozy blanket makes for a perfect basket liner. 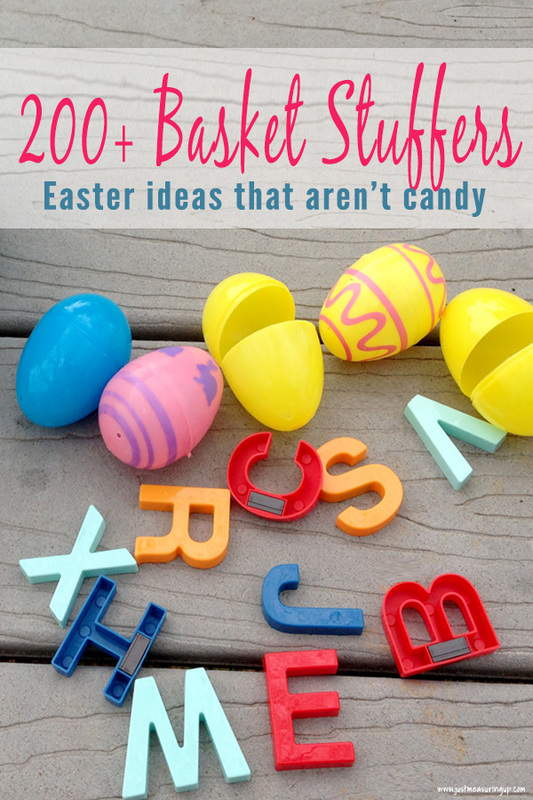 If you are stuck on ideas for a candy-free basket for a friend or family member (who probably has everything), why not make them a basket with one of these practical Easter basket ideas. Fill it with practical things that you always need – like scissors, batteries, and sharpies. My sister filled our stockings one year with practical items, and they were a big hit! 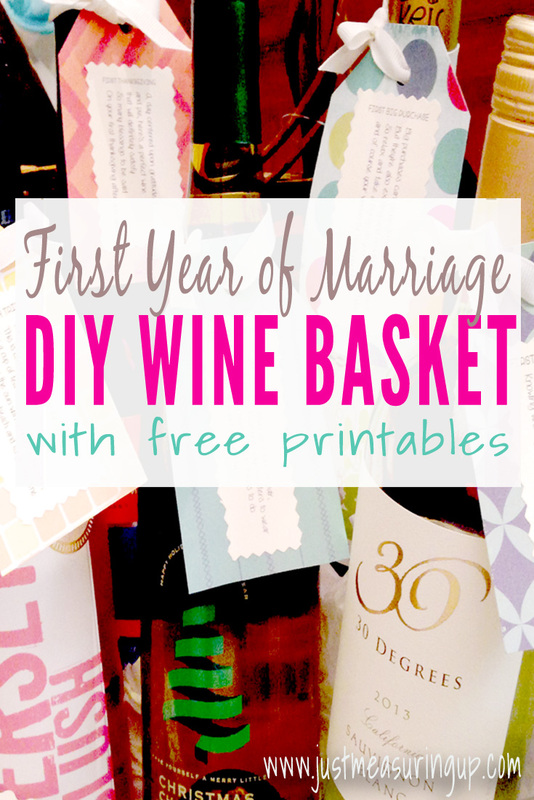 Line the basket with bubble wrap or packing paper, something practical that will be reused. With all these Easter baskets, don’t forget about your beloved pets. Pets are easy to shop for, and they don’t eat candy – so anything goes! 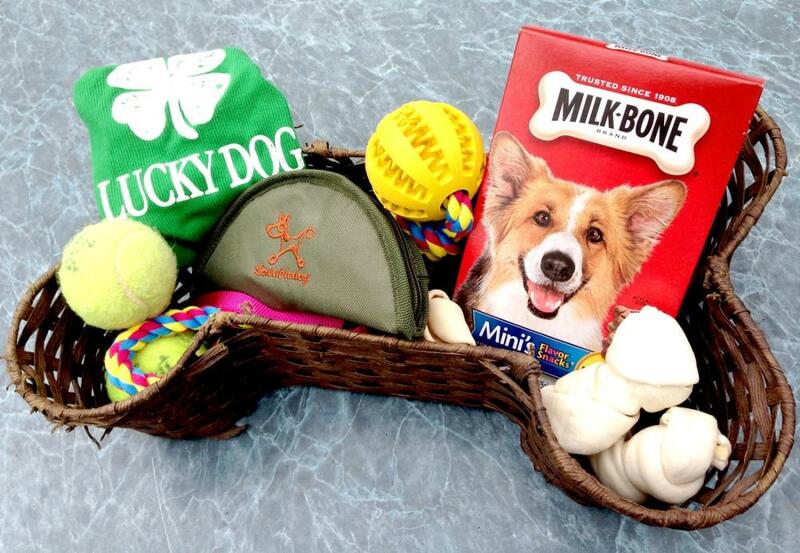 Use a basket that you can reuse as your dog or cat’s toy bin. Healthy eating is so important for kids, and many kids these days have food aversions, allergies, or only eat macaroni and cheese and chocolate. The below fun eating dishes and other ideas can be used to encourage and promote healthy eating. Use the easy wipe cloth as a basket liner, as a cute Easter grass alternative. Just as I was stressing out about filling candy-free Easter baskets, I was also wondering what I was going to fill Easter eggs with. I came up with two lists – a small toy list and a toy-free list. I LOVE the toy-free list – it has so many creative, fun ideas. Legos – Fill all the eggs with legos. After the eggs are found, have kids each build something with the legos from their eggs. 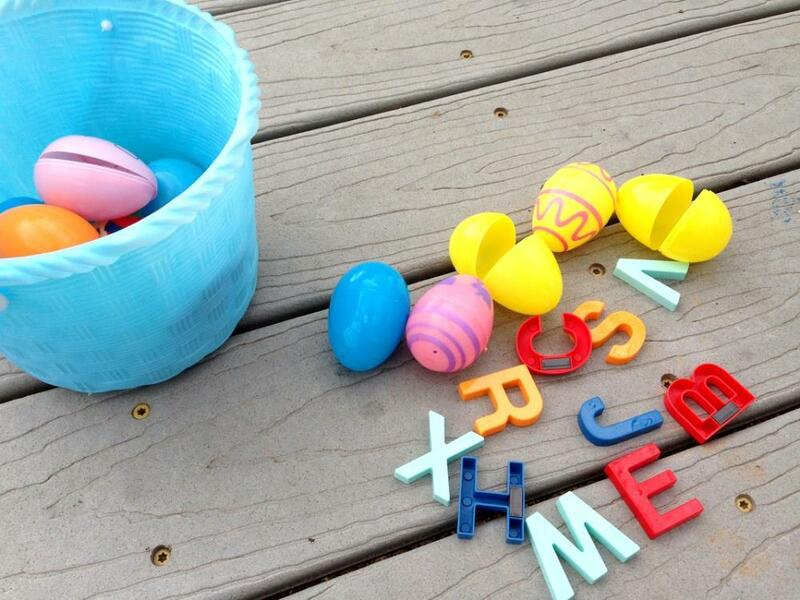 Alphabet magnetic letters – After collecting all of the eggs, see if you can spell any words from your collected letters. Use cookie trays for a magnetic surface for word building. Scavenger hunt clues – Start by giving every participant an egg. Participants will open the given egg for the clue to the next egg. From crafty baskets to summery baskets to outdoorsy baskets, kids will love these creative items and not even notice that they don’t include candy or junk. And, adults will love the time and thought you put into creating these candy-free Easter baskets. Additionally, the creative Easter egg hunt ideas are perfect for friendly competition or a good laugh. With hundreds of ideas for Easter baskets and egg hunts, you can totally pull off a candy-free, junk-food free Easter without any stress. When out shopping, I can’t resist a great deal. This past holiday season, I bought quite a few things that I loved but had no need for. Yet, when the price is right, I can’t resist. 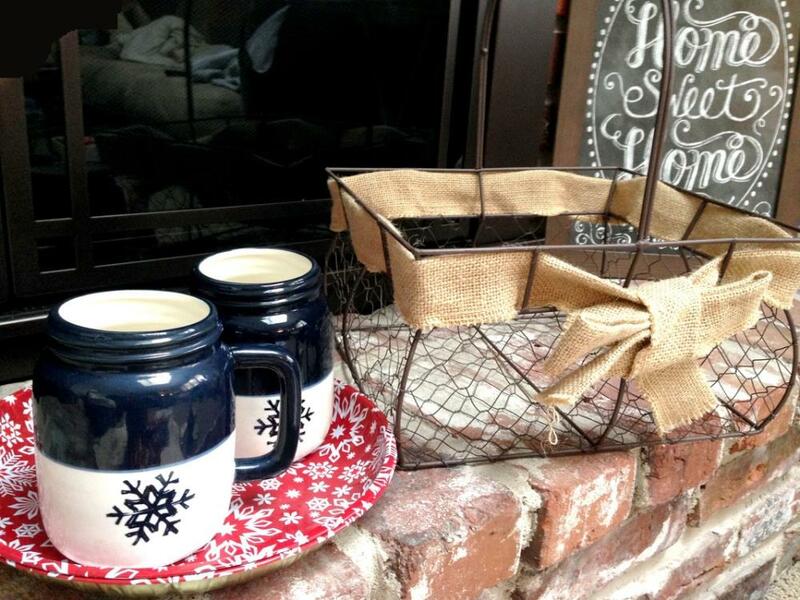 At Michaels, I picked up the below wire basket with the burlap ribbon and the two navy snowflake mugs 70% off. Yet, the holidays came and went and I hadn’t done anything with these items. Shortly thereafter, I thought of putting together a winter picnic basket. 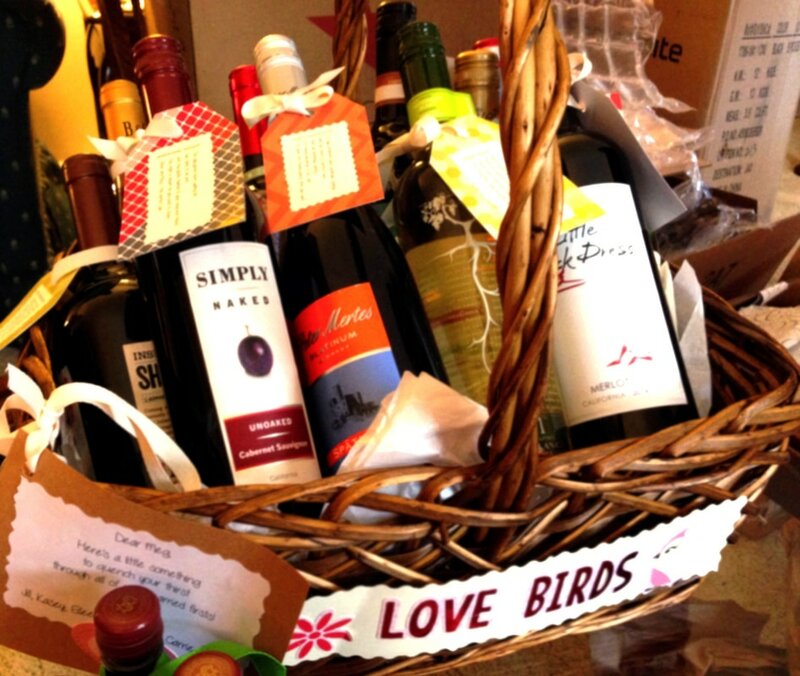 I love giving gift boxes and baskets – they are fun to put together and unique gifts are always so appreciated. 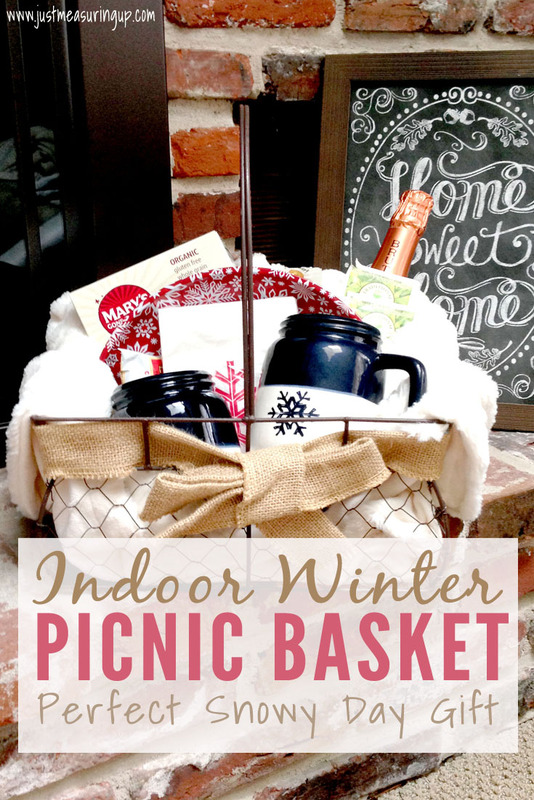 This indoor winter picnic basket is perfect for so many occasions – a special gift for your husband or wife, a Valentines picnic basket for couples or families, or a holiday gift for someone who has everything. It’s even something you could save for a snowy day spent fireside. 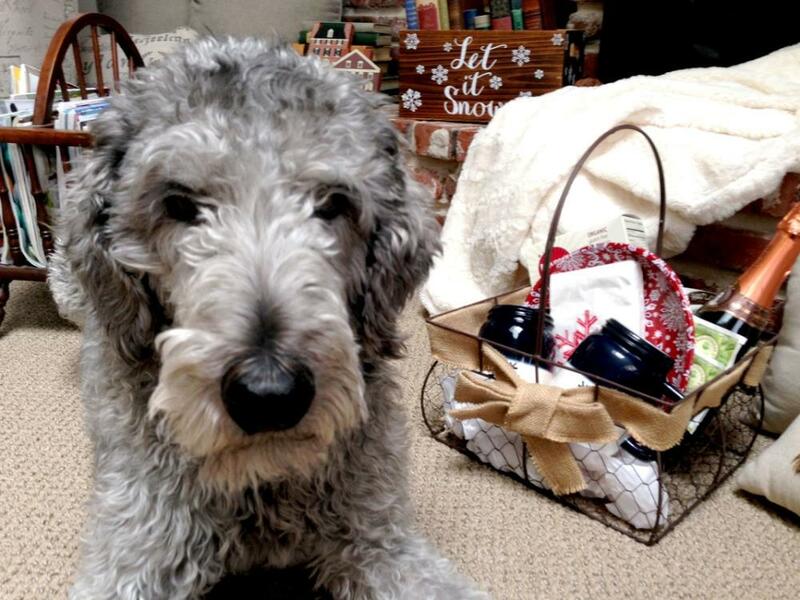 ​My favorite part of this gift is the soft, fluffy blanket that I used to line the basket. The blanket is perfect for an indoor picnic – and who couldn’t use another cozy throw?! 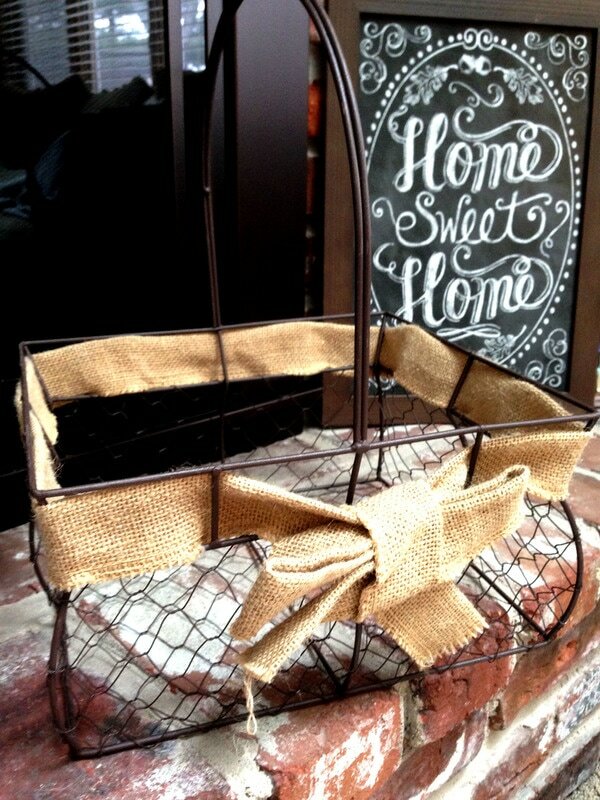 I just love this wire basket – it’s rustic yet modern looking. I picked up the red snowflake plates and napkins to go with the mugs (Dollar Tree finds). Navy and red are one of my favorite color combinations. When picking snacks, don’t forget to think about refrigeration. If you are giving it as a gift, you probably want to stay away from things needing to be refrigerated – like cheese. You could also include a thermos that could be used for hot chocolate or soups. To assemble, I simply laid the blanket at the bottom of the basket, wrapping the extra around the back, and arranged the items. The blanket worked great for the lining because it made propping up the items easy – and it served as cushion for the fragile mugs. I had a little “help” with the arranging… our buddy Zeus. He actually wanted the crackers in the basket and was begging 🙂 He looks huge next to the basket. As a side note, in this picture, I was attempting to use tissue paper at the bottom of the basket, but the drab tissue took the elegant basket down a few notches. That’s when I decided to make the blanket work. The basket took minutes to put together, and the total cost was around $30. 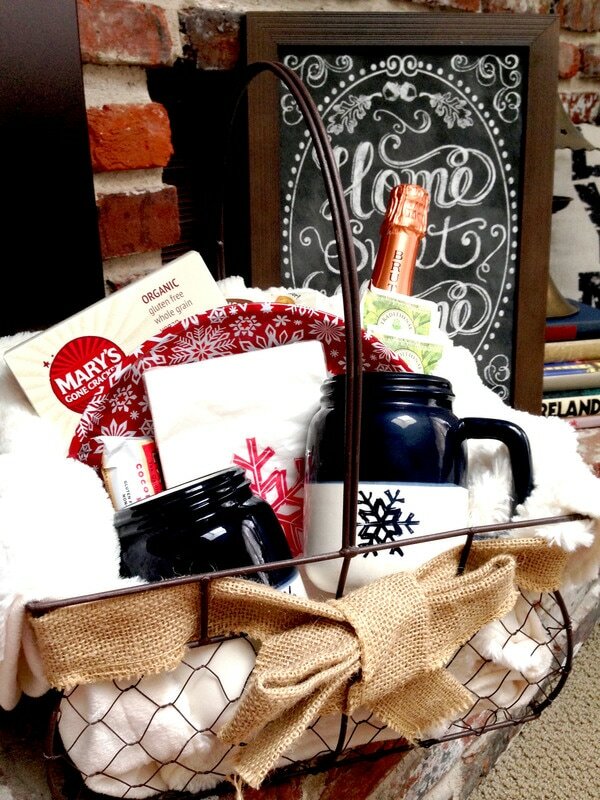 The basket, mugs, plates, and napkins were $8 – you can’t beat that! With the Christmas season upon us and holiday traditions in full swing, making and decorating cookies definitely holds a special spot in my heart. This year rather than just exchanging cookies, think about putting together a holiday cookie decorating box for kids and their families to enjoy. This gift provides a festive activity that kids will long remember. I made one of these boxes for my niece years ago. 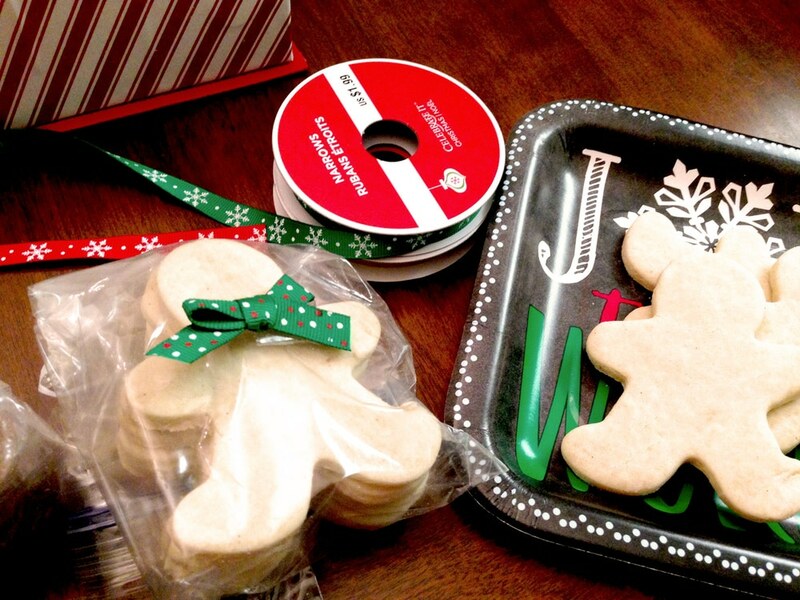 Each Christmas, we would always bake and decorate cookies together – it was our special thing. However, one Christmas I had just had my son, so I made my niece this little box, so she would still be able to decorate Christmas cookies that year. 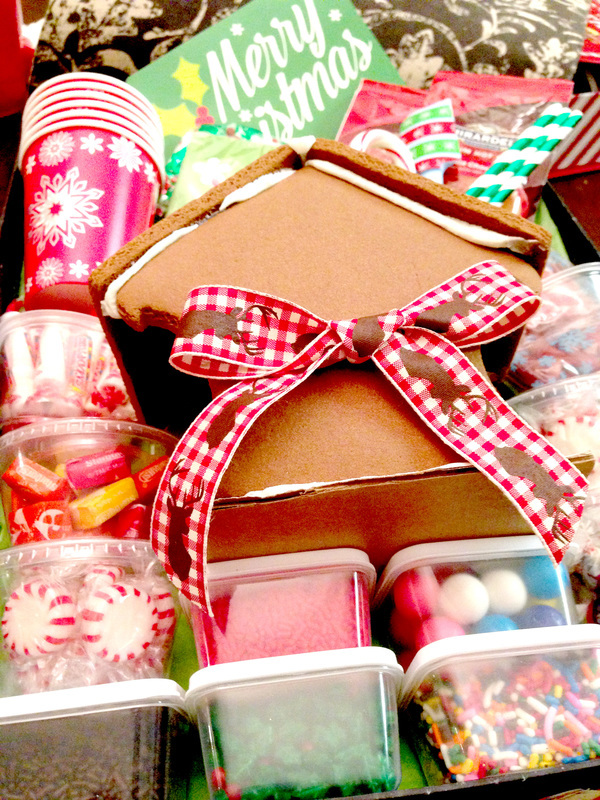 ​​In addition to putting together a holiday cookie decorating box for others, you could also make one for your family. 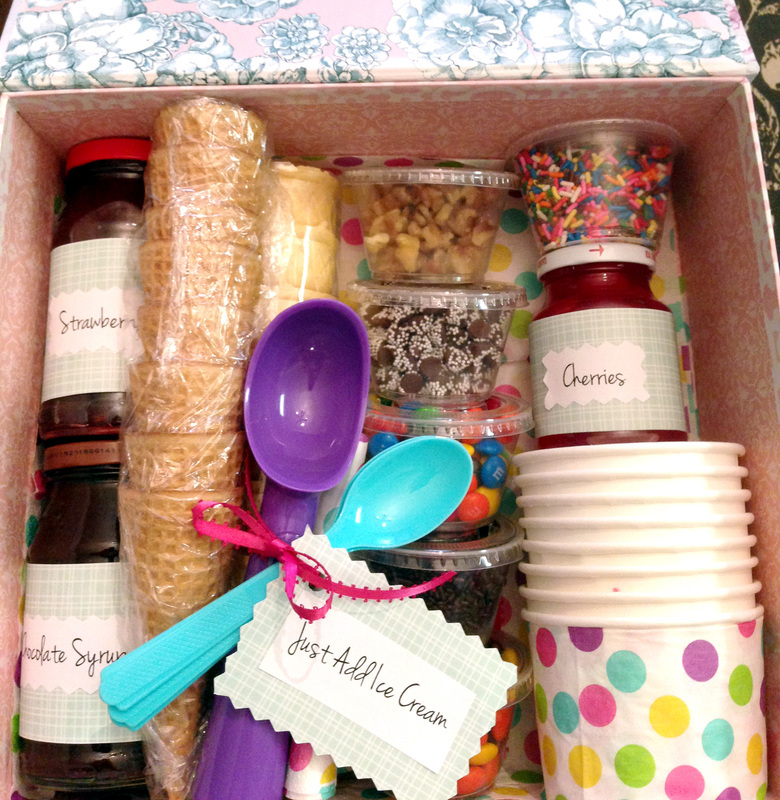 ​​Not only is this box super easy to make, but it doesn’t involve screen time nor is it another toy. ​And, if you are even a little bit of a baker or crafter, you probably already have a lot of the materials. 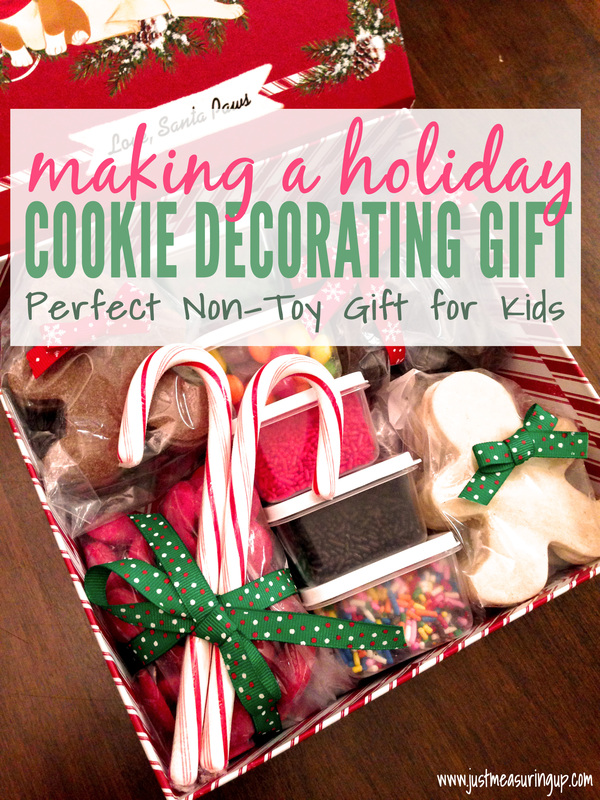 About a dozen roll-out cookies – Baking the cookies ahead of time cuts out on the mess, and let the kids go straight to the fun part – the decorating. First, you’ll want to bake your cookies and let them cool. My family eats pretty healthy these days (one day I’ll share that story). So, I always make things as healthy as possible. Additionally, ​I made these cookies without dairy, egg, or gluten. I’ve gone through quite my share of recipes, as well as trying to use substitutes on my own recipes. Hands down, the best one is from The Unconventional Baker. She also shares recipes for chocolate roll-out and vanilla roll-out cookies. ​Her instructions were great. And, the cookies rolled out very well! Also, they don’t use cane sugar, and they taste just as a roll out cookie should. After they cooled, I placed about eight of each type of cookie in a stack and put them into a ziploc bag. I folded the bag, so you wouldn’t see the zipper part when placed in the box. 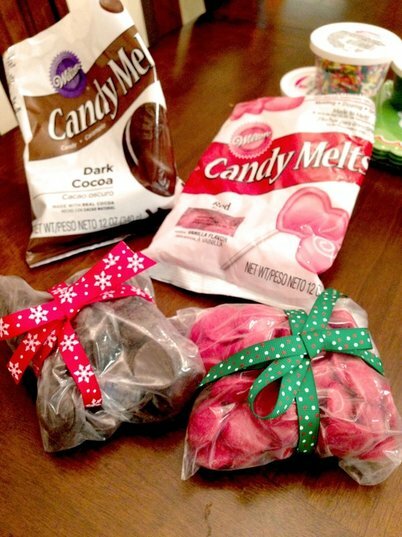 Next, I took the candy melts and poured them into ziploc bags. Afterward, ​I also tied ribbon around these to make them look more festive. 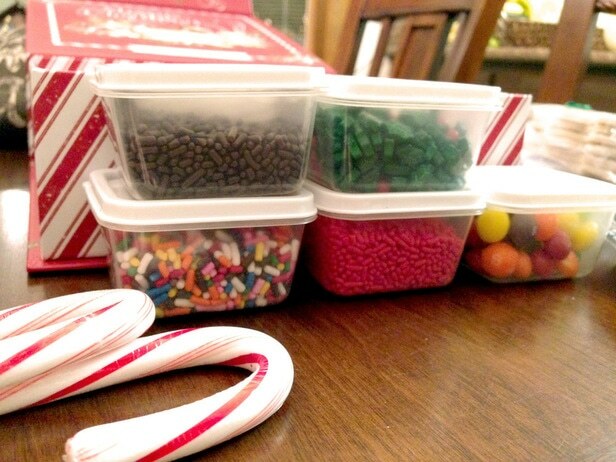 Additionally, I found these cute little containers at Dollar Tree (10 for $1) and filled them with sprinkles and candies for decorating. Next, I arranged everything into this Michael’s box. They have the cutest boxes for all holidays and seasons – and I always seem to shop when they are 70% off, which made this box $3! The last thing I did was add a few candy canes because they make everything look so festive. 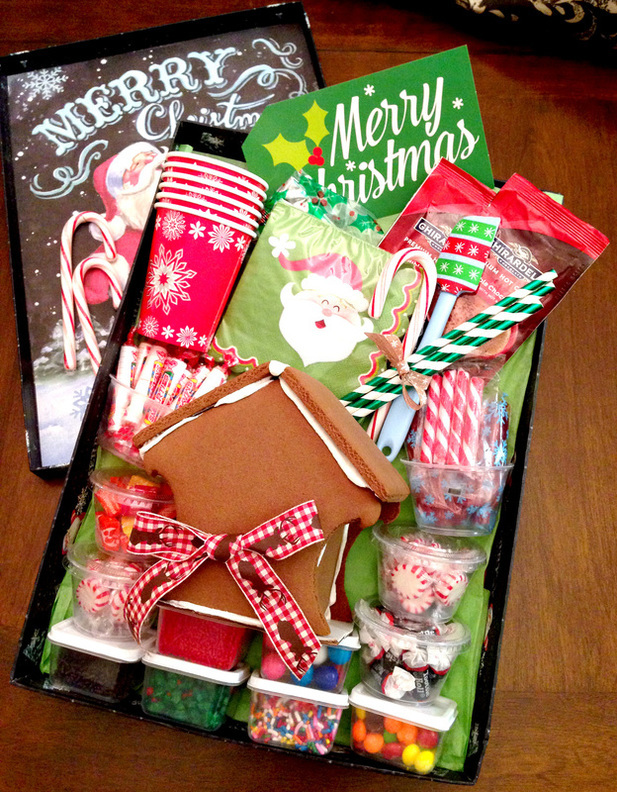 ​If I had a little more room in the holiday cookie decorating box, I would have added hot cocoa, paper cups, and cute straws, which would have made for a nice touch. 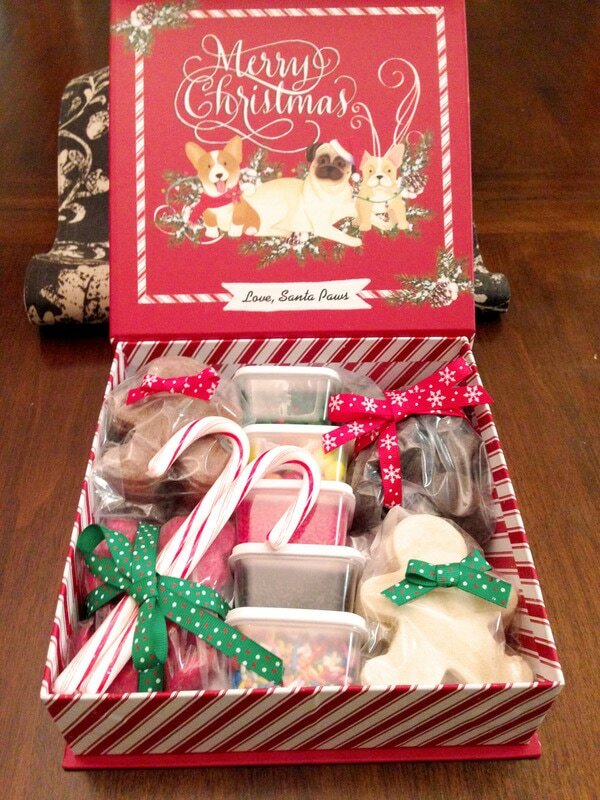 I spent only around $7 on this holiday cookie decorating box, as I already had everything but the box and candy melts. ​Spending only $7 on a gift is quite amazing, right? This year, as you get caught in the whirlwind of the holiday season, remember that decorating cookies is something simple, thrifty, and delicious to give! And, I’m sure if you start this Christmas Eve tradition of decorating cookies for Santa, your kids will remember and blissfully look forward to it each year. Michaels Crafts always has beautiful gift boxes. They run a lot of 70% off sales, especially at the end of seasons, making them only a few dollars. I wasn’t planning on making any Christmas gift boxes this year. However, they ran their 70% off sale last weekend, so I picked up quite a few boxes and baskets. 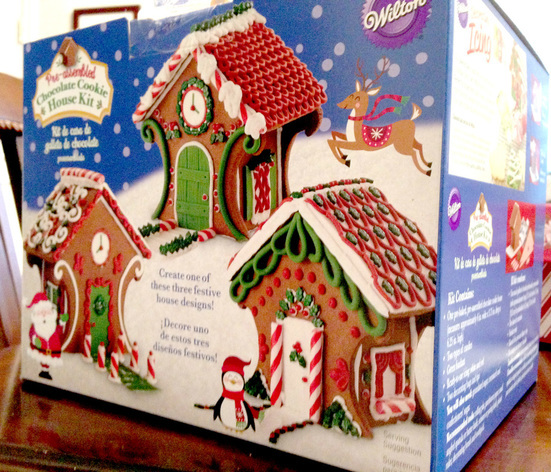 I picked up a gingerbread house decorating kit too – also on sale. My niece and nephew love to do these, but we usually don’t have enough candy to decorate the house with – so we end up buying more to supplement. 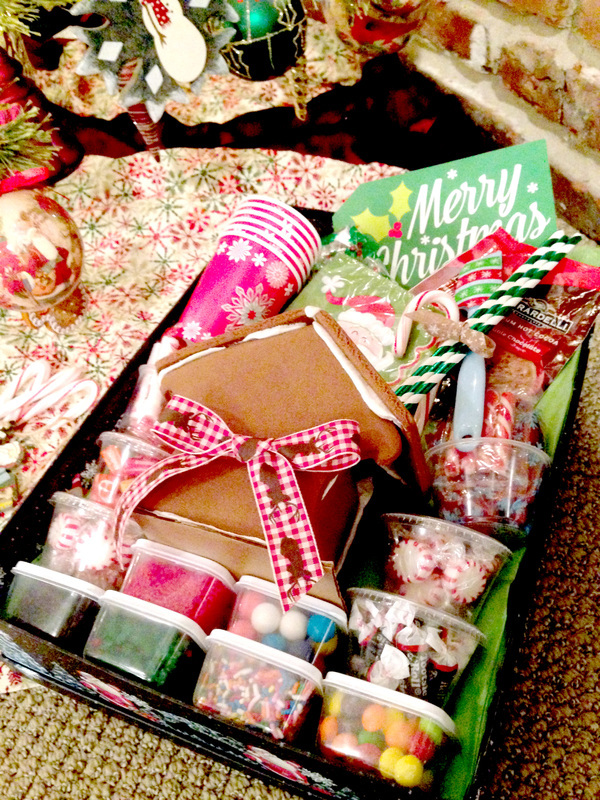 I was thinking I could unpackage the pre-made gingerbread kit, compile more decorating items, and arrange everything into a pretty gift box. I also added hot cocoa items. 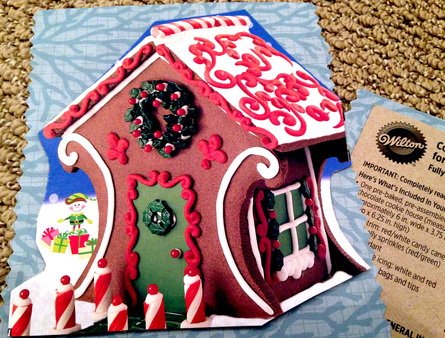 Now what store-bought gingerbread decorating kit also has hot cocoa?! :)​The best part is that I only spent $18 on this gift box! So many times gift boxes are filled with things that really add up. This one is cheap and the items were easy to throw together. As far as materials, you can really use anything you like – you could even use graham crackers, a container of frosting, and decorating icing, rather than buying a pre-packaged kit. 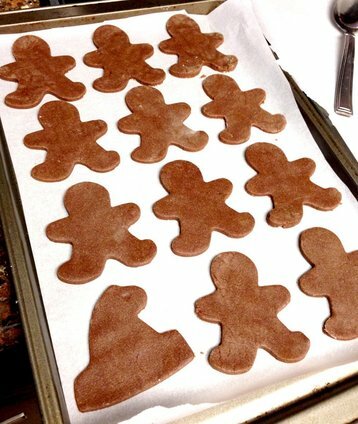 First, I unpackaged everything in the gingerbread kit to see what I had to work with. 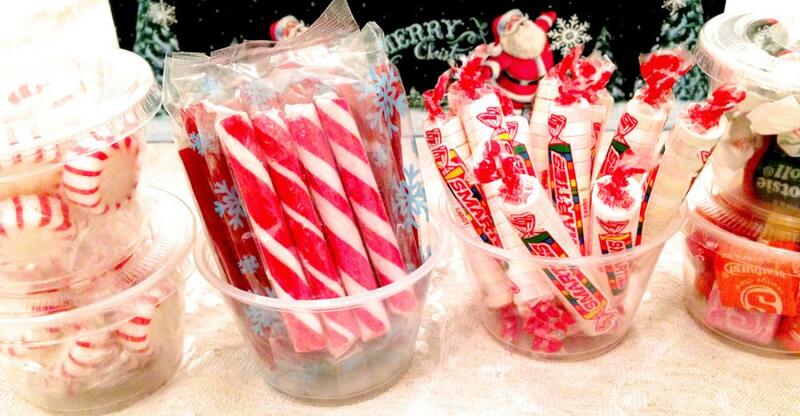 ​Then, I added in more candy that would be fun for decorating – twizzlers, smarties, peppermints, gum balls, starbursts, skittles, and tootsie rolls. I probably bought too much candy, but variety makes for fun decorating. I also grabbed a few kinds of sprinkles that I already had, and then I simply filled the containers with all of the sweets. 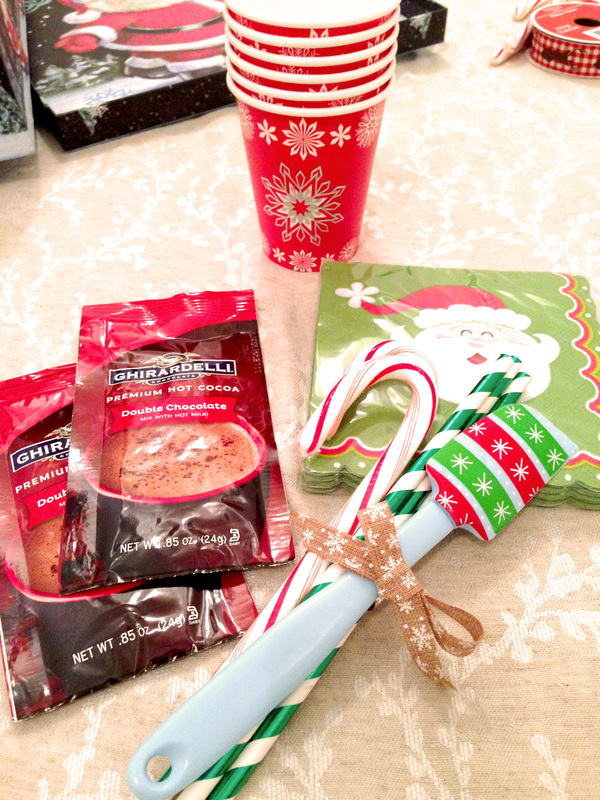 Then, I put together the non-food items – cups, cocoa, straws, the spatula, and napkins. I tied a few of the things together with some holiday ribbon, as pictured below. Next, I put together the icing. 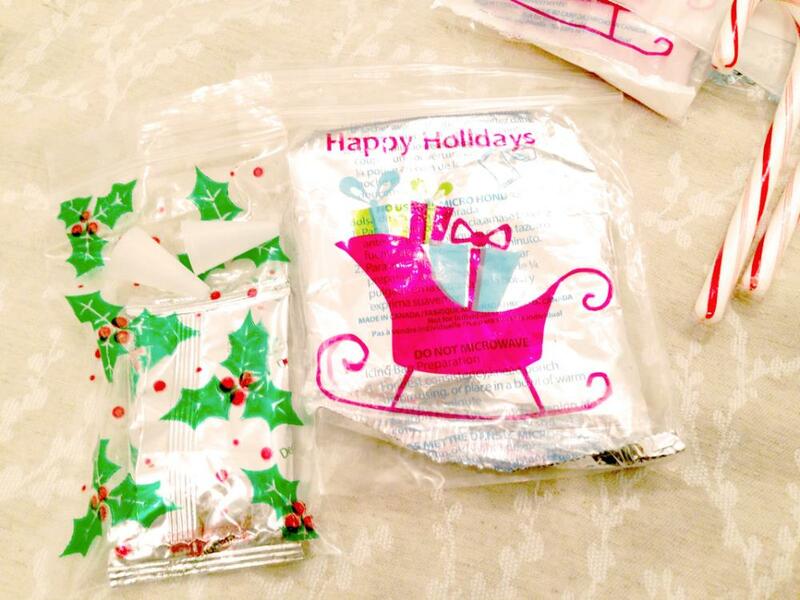 The kit came with three icing packets along with disposable icing bags and plastic tops. The gingerbread house looked a little plain so I adorned it with ribbon (another 70% off Michaels find). If anyone has an easy bow-tying trick, let me know because I am the worst at it! Also, I found a cute Merry Christmas tag (from a Dollar Store photo prop kit!! Check out our DIY photo booth post). 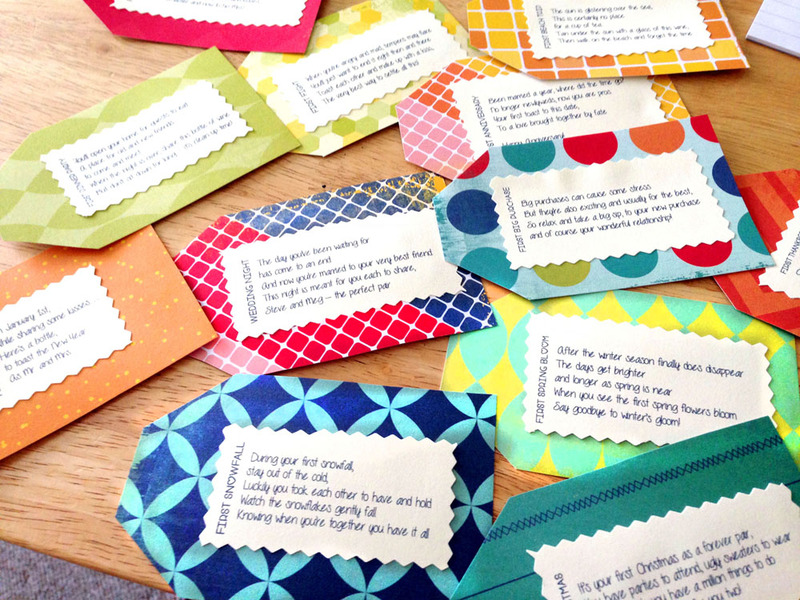 That’s the great part about doing crafts – your craft bank grows and grows, and then you have so much to work with. 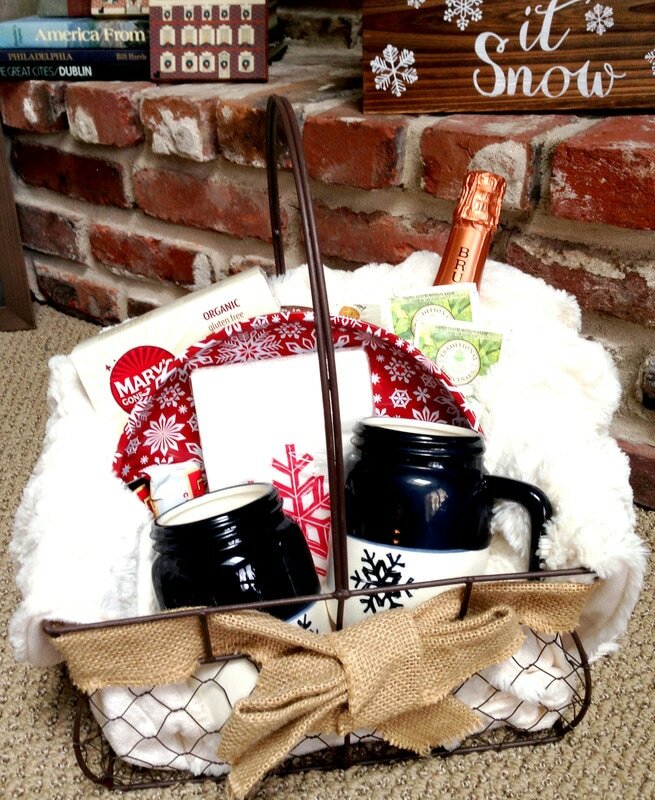 I love making cute gift baskets – so much that I have a board on Pinterest entirely devoted to homemade gift baskets and boxes. Whenever I’m stuck for a gift, whether Christmas gifts or shower gifts, I always think about what I can put in a gift basket as a themed gift. My sister-in-law and her family were staying with us for their family vacation this year, and I wanted to do something special for them. 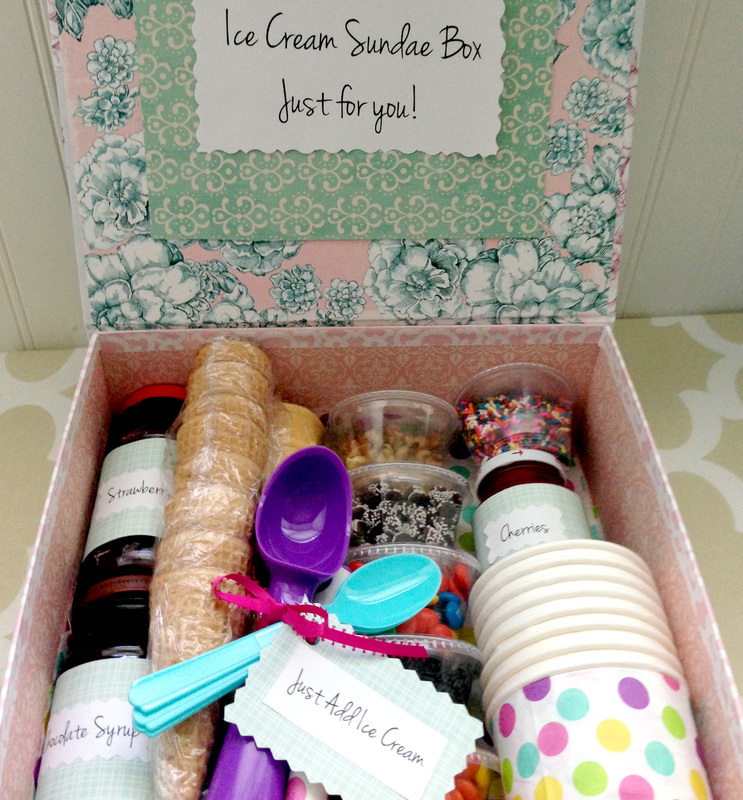 I made this cute DIY ice cream sundae gift basket, and it was a hit! 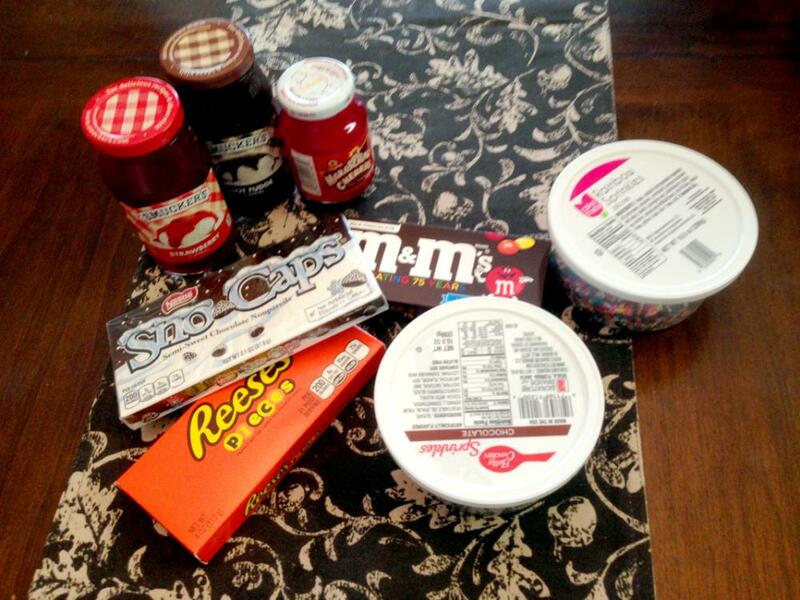 First, I collected the materials that I needed for DIY ice cream sundae gift box. I went to Michael’s and they were having an awesome summer blowout sale on gift boxes. I got this gift box for just three dollars! Of course, I bought a few of them for later projects. Next, on my weekly trip to the grocery store, I purchased a few of the ice cream box necessities – chocolate syrup, strawberry syrup, cherries, and cones. I also bought a few boxes of candy that could be used as toppings. The boxes were on sale for .99 cents. Also at Walmart, I found polka dot napkins and turquoise spoons for a dollar per pack. I also found ice cream cups there for $3 per pack. If you are looking to buy a kit, there’s a great ice cream sundae kit on Amazon, which has the cups, spoons, straws, and little umbrellas in bright and cheery colors. Last, I purchased the condiment cups on Amazon. Love Amazon! I also needed the condiment cups for my son’s Sesame Street themed birthday party, so I bought a big bag. 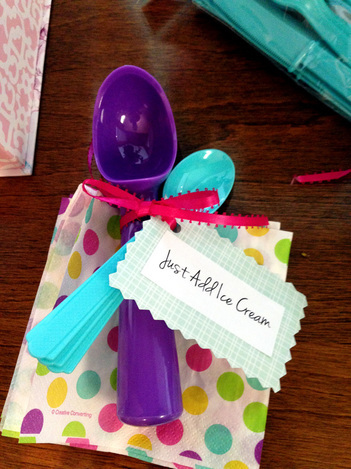 The next step was the fun part – putting everything together into a cute ice cream sundae gift basket. I poured the boxes of candy into the condiment cups. The boxes were a perfect fit because I had little to none leftover. I unwrapped two different kinds of cones (I bought a variety pack) and wrapped a stack of them in cellophane for freshness. 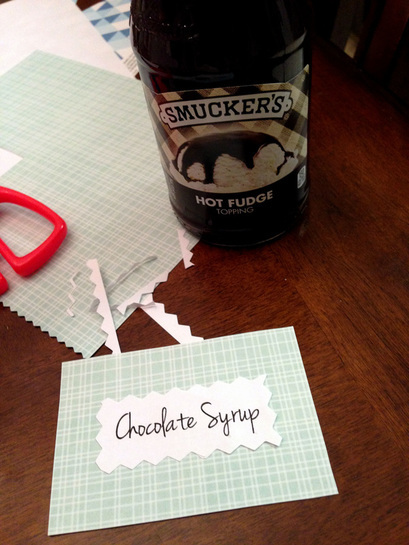 Then I printed my own labels that read “chocolate syrup, cherries, etc” (see download below) on regular white printer paper. I glued the labels to the scrapbook paper and then taped them to the jars, for a cute, uniform look. 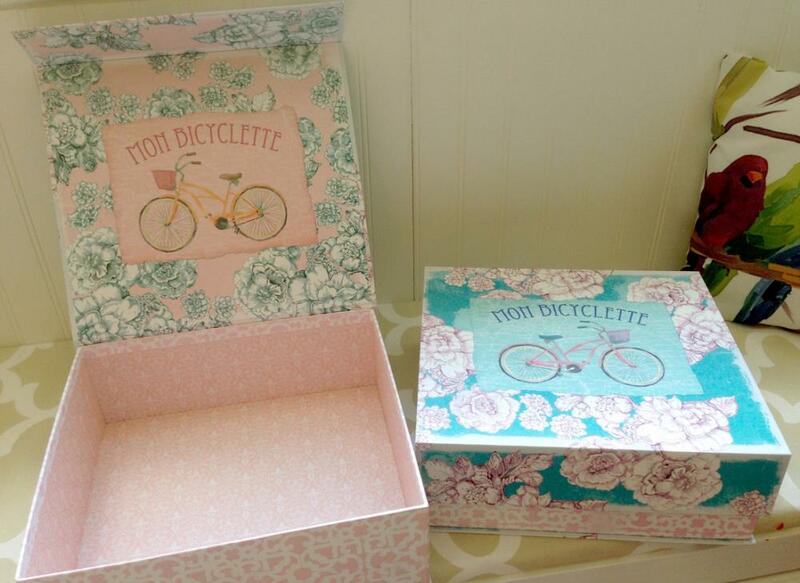 Last, I added a sign to the top of the box, covering up the bicycle design. As far as cost, I saved a lot of money with the discounted box, grocery store sales, and good finds at Walmart. Altogether, I spent just less than $35 dollars (with the condiment cups being $10.50 and tons of these leftover for other projects) on the this DIY ice cream sundae gift basket. 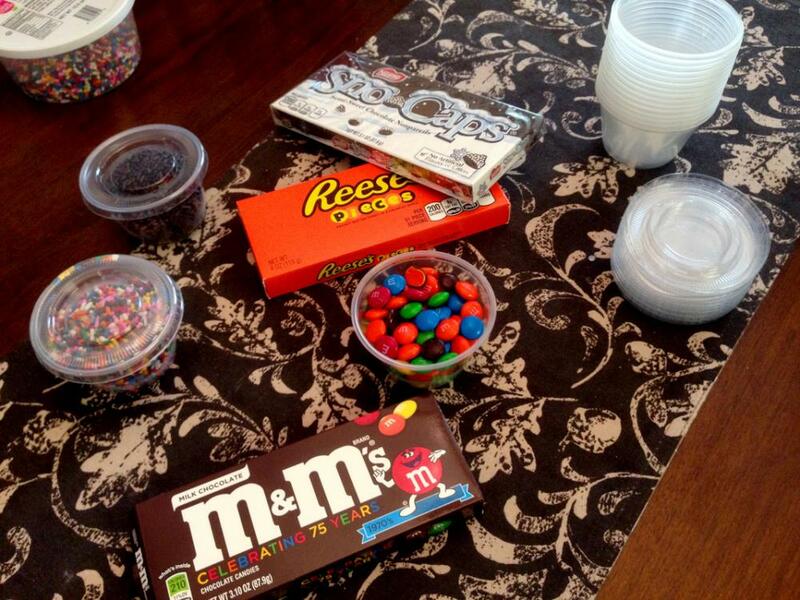 Considering we had ice cream sundaes for seven people and tons of leftovers, I still think that’s a great deal! 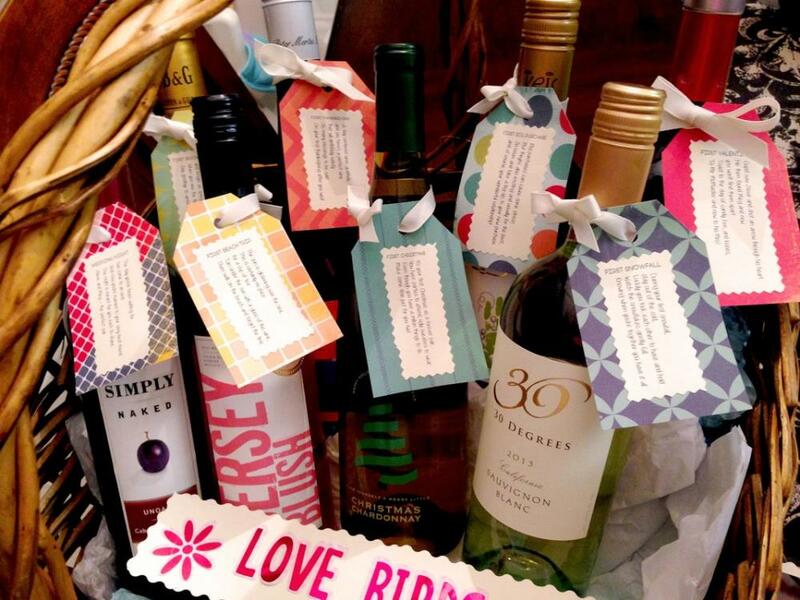 It’s a great summer gift basket, housewarming gift, a sunshine gift for someone who needs some positivity – the list is endless, and everyone always loves it! I’m always looking for cute greeting card ideas for my kids to make. 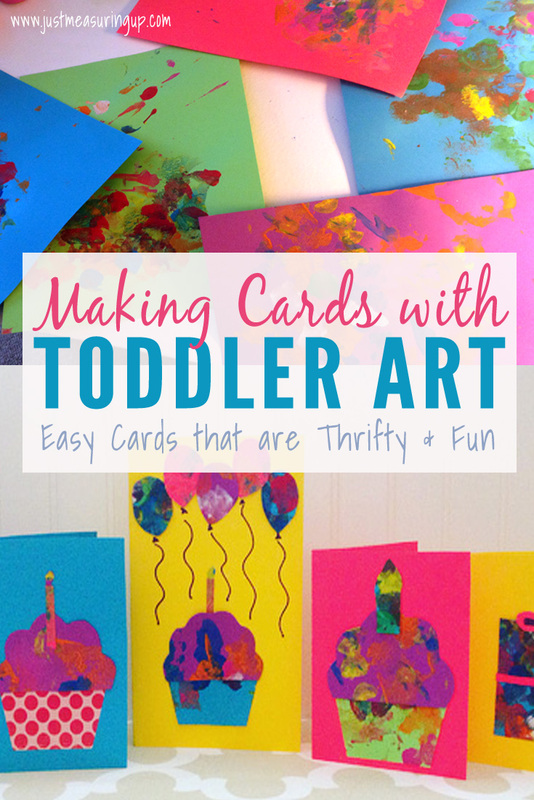 There are so many fun cards out there that creatively use kids’ hand and footprints. Although cute, I always had trouble getting one decent hand or footprint for a greeting card. Not to mention the mess it makes. As any toddler’s paintings would be, my little guy’s artwork was very abstract. I was having him make birthday cards for all of the August birthdays in my family. 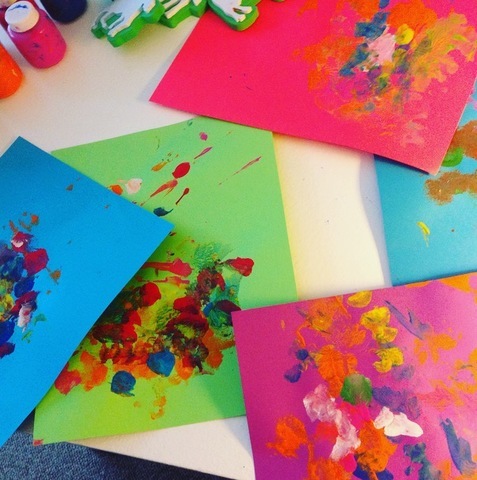 Yet, rather than give messy toddler paint prints, I thought of a great way to showcase his art but to also turn it into a nice-looking greeting card. So after my son did a little painting, I did a little cutting and gluing – and voila! Don’t the birthday cards look nice?! Making these greeting cards is so simple. The materials are so easy too. Most likely, you will even already have all of these things. 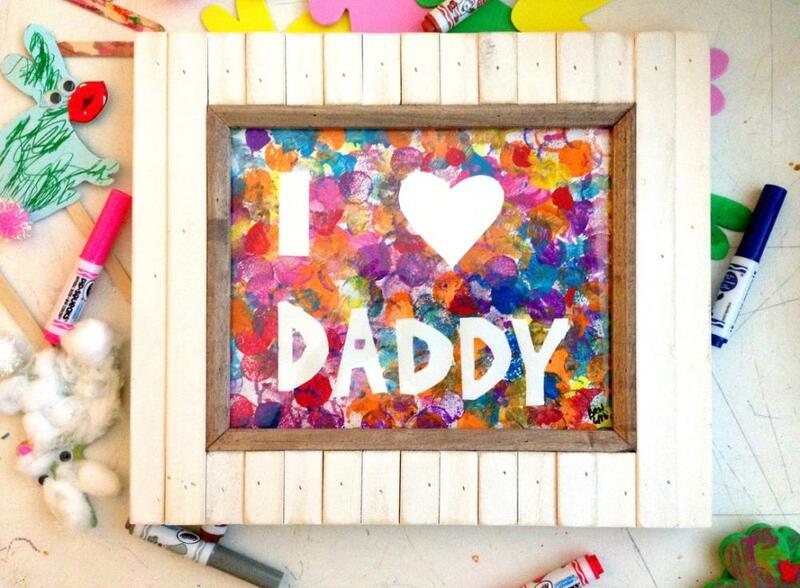 Kids paint – I love this washable Crayola paint. Lots of color choices keep my son very interested in painting! Sharpie/Marker (if needed) – I used a sharpie to add the balloon strings. You could use ribbon too! 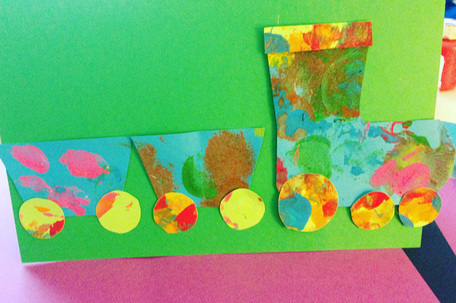 After my toddler painted on the card stock papers, I let them dry for a few hours or so. 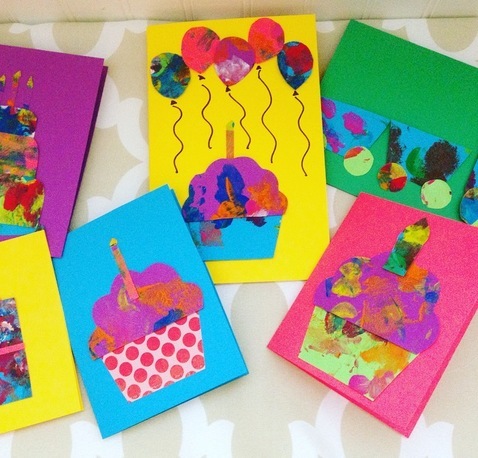 Then, I cut his paintings into shapes – cupcakes, presents, balloons, and layered cake for the birthday cards. 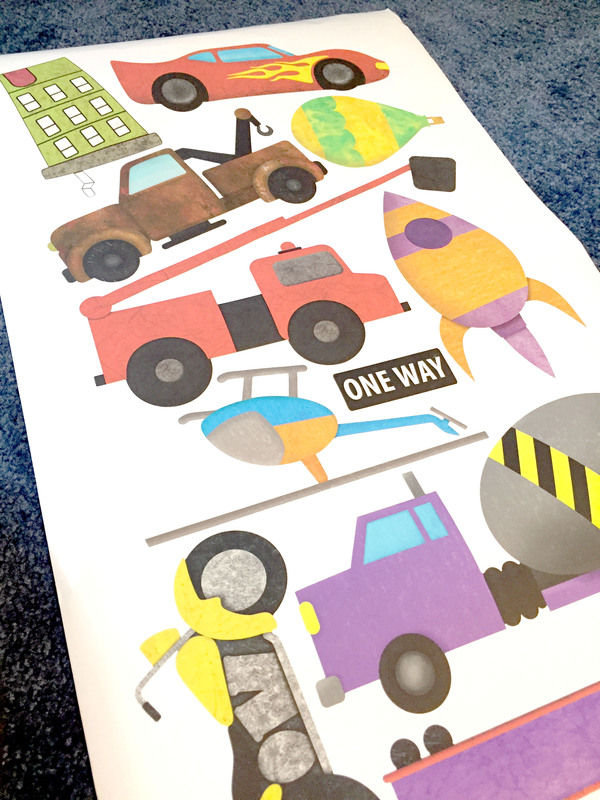 I then took a new piece of card stock (a contrasting color), folded it in half, and trimmed off the top (unless I was going for a tall card – like the balloons and train). After, I took the birthday items that I cut and glued them down to the card. 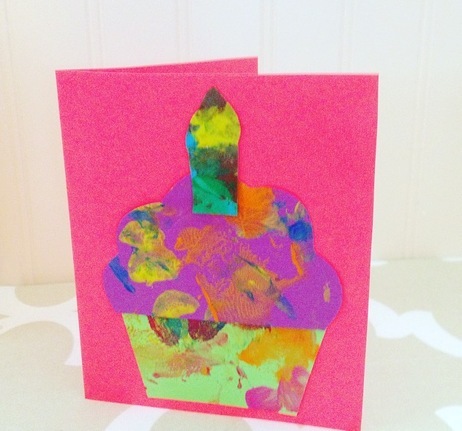 After making cards for all the August birthdays, I was running low on paintings, so I substituted printed scrapbook paper (here is a similar one) that looked like a cupcake wrapper. 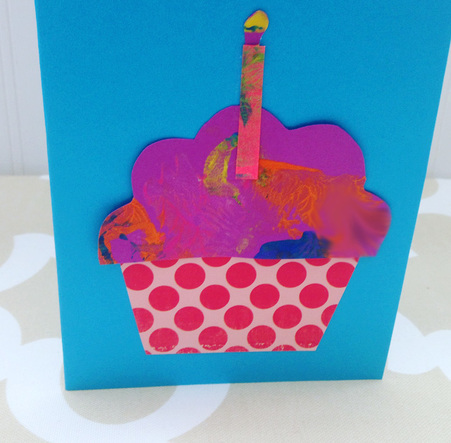 While making cards with toddlers, you can dress up the cards by adding some embellishments to the front of the card. I added the word happy with letter stickers because the present birthday card looked a little plain. 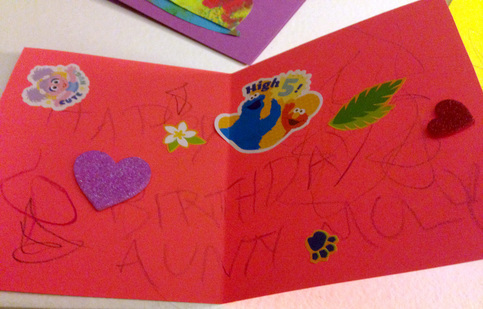 Last, to give the greeting cards just a little more of a personal touch, I had my son decorate the inside. He colored with his crayons and picked out stickers. This gave him another opportunity to be creative making birthday cards. I just love how the birthday cards turned out! My son got to be as creative as he wanted with no restrictions (like finger prints or footprints), and I got to help my toddler create something to give to others that was refrigerator-worthy. Even though I used birthday shapes for this batch of greeting cards, you could easily alter the shapes for holidays too. 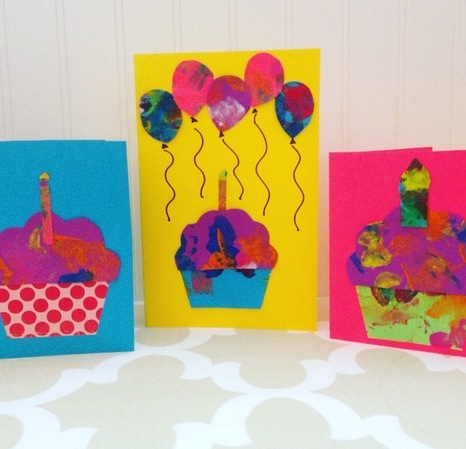 Making cards with toddlers is a win-win for everyone involved. 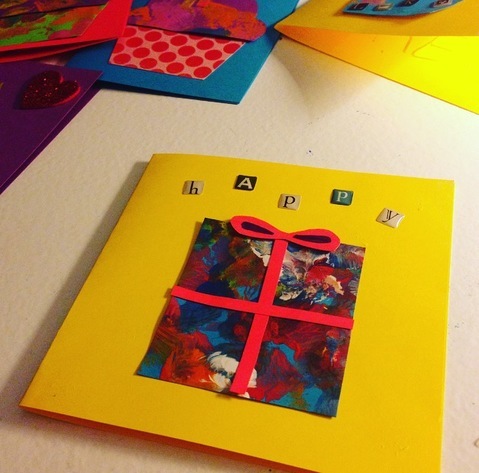 Your child gets to do a fun activity, you get to save some money with homemade cards, and your family members/friends get a creative, cute card, showcasing your child’s work.